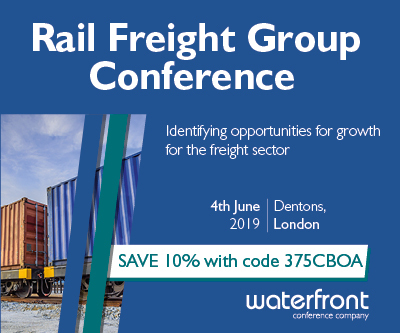 CBOA are supporting the 27th Annual Rail Freight Group Conference on June 4th in London. To register please email conference@thewaterfront.co.uk or call 0207 067 1597 and quote the discount code 375CBOA. Use of waterways for freight and passenger services: advocated by government and facilitated by London’s Mayor. Click here to read more. CBOA will again be exhibiting at the Recycling & Waste Management (RWM) Exhibition, 11th & 12th September, in partnership with the Canal & River Trust. CBOA are supporting the 27th Annual Rail Freight Group Conference on June 4th in London. Click here to read more. Land & Water create Thames liquid highway - click here to read the article. 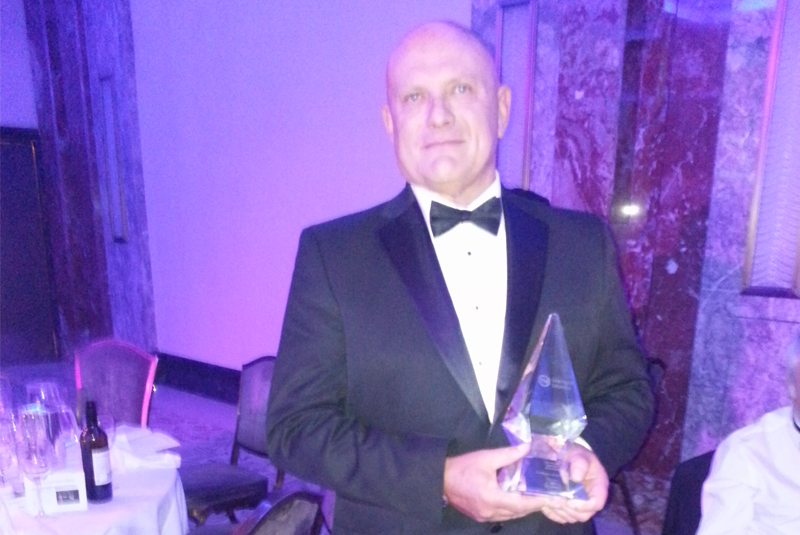 CBOA congratulates Members GPS Marine Contractors Ltd on winning the prestigious Freight Transport Association’s Sea Freight Operator of the Year 2018 Award, which was presented to John Spencer (GPS’ managing director) at a gala dinner of the whole logistics industry. The judges’ comment was “An efficient, safe way to move huge volumes of aggregate through a crowded city”. Between January and August 2018, CBOA member Wood Hall and Heward Ltd (WHH) operated a push tug and three hoppers carrying a range of aggregates from 20 mm stone to dust, top soil, sand & soil etc. to the Southall Gas Works construction site. Click here to read more. London-based waste management company Powerday has announced a partnership with start-up company IRecycle (CBOA member) to offer a commercial waste service in the capital using barges to transport material. Click here to read more. David Lowe, the CBOA chairman, was one of the key speakers at a Leeds conference in October, speaking about the role of the water freight industry in the modern world [see photo]. It was organised by Canal & River Trust together with the Freight Transport Association in conjunction with a visit to Yorkshire by members of the Inland Waterways Transport Solutions team. The IWTS team is an EU funded project under their Interreg programme which bring together inland waterways freight carriage interests from countries bordering the North Sea. This project began about a year ago and has a four year programme. Their work stream includes the development of smaller barges design with cleaner engines. Among the speakers were Arjen Mintjes and Jorn Boll, both from the Maritime Academy, Harlingden, The Netherlands. The Academy trains over 2,500 people a year for the maritime industry – 50% of whom go to work on barges. In fact, the Academy provided training to new crews working on the new barges operating on the Thames Tideway Tunnel project. They also explained that some Dutch cities have banned large diesel engined lorries from their medieval city centres, insisting on barges being used – such as the 18 tonne capacity Utrecht beer barge – for local deliveries. This is a result of a trend for barges getting larger and so being unable to access the smaller city canals. The smaller barges collect from out of town barge terminals. In the Utrecht case, small barges are also used to take out waste – not the same ones which take in the beer! CRT’s Steve Higham spoke with enthusiasm about the Trust’s aspirations for a new wharf for the Port of Leeds and the local authority offer of £3m + funding. He pointed out that Transport for the North reckon that road and rail capacity is close to capacity and so are looking at the under-used waterways. He mentioned that Yorkshire's air quality is one of the worst in Europe. Sara Rogerson from a Swedish university spoke about trials which had been undertaken to move containers inland from Gothenburg, the country's leading container port. The inland waterway are already used by ships (e.g exporting timber to the UK and elsewhere) . The would-be barge operators are having to explain that barges don’t need pilots in the same way that ships do. Antoon van Coillie from the Belgian based Blue Line Logistics spoke about his flat bed Zulu pontoon barges. He comes from the construction world and so brings a user’s perspective. He is very keen on reducing handling costs and all that his craft need for loading/unloading is a hard flat surface on which to unload. The photo [attached] shows a hook lorry loading roll-on/off containers but his team are as much at home with pallets being on/offloaded with a fork lift truck. He’s also keen on minimising crew costs and dispenses with a crew cabin. His existing two Zulu barges have been so successful that he’s soon taking delivery of another two. He's keen on using smaller barges (300 tonne capacity) in order to fit the delivery size to what the customer wants. He sees his concept as deliverable in the UK and has been talking to a number of possible users. The seminar ended with a presentation from Adina Vaillaux from the Port of Hamburg marketing team who talked about enhancing Baltic country navigations in Sweden, Finland, Lithuania and Poland with an emphasis on moving containers on the River Vistula to Bodgosh. 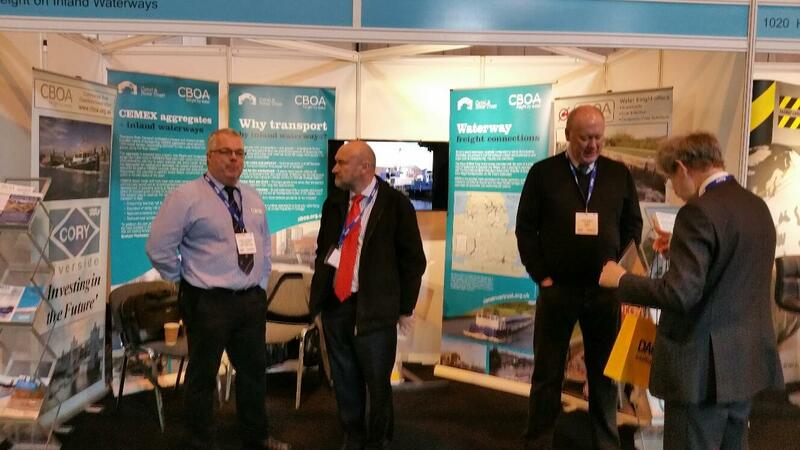 CBOA/CRT officers noted down as many as 17 enquiries over the two days of the RWM Show in September. Most were of high quality with few in the “generally interested” category. There were eight serious potential enquiries, all of which have been followed up by CBOA. They covered the Yorkshire, Nottingham, Thames/Medway and Mersey areas. A further two were from companies with whom CBOA is already in contact. Two others were from trade associations where CBOA believes it can help. 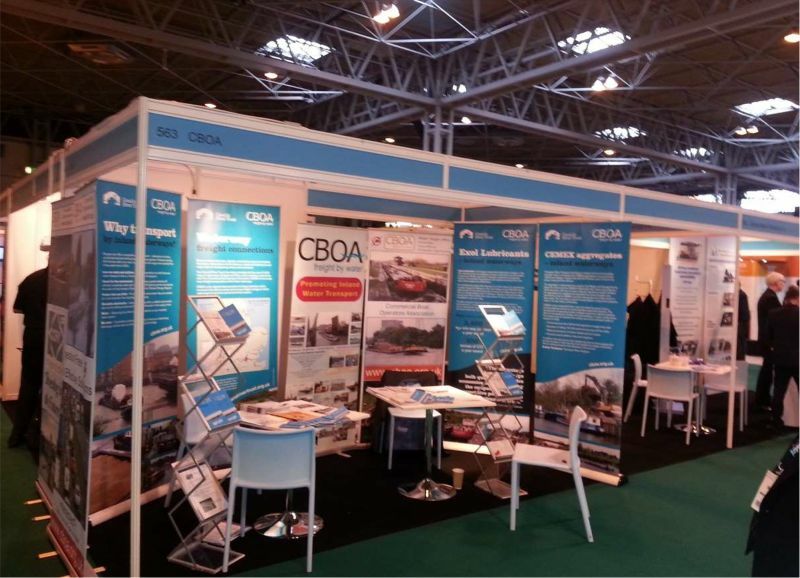 The CBOA exhibition stand, aided by the Canal & River Trust, was on display at the Recycling and Waste Management Show which was held at the National Exhibition Centre, near Birmingham. Previously, the stand has been at the Multimodal Show for several years. RWM was different type of Show. Multimodal is a gathering of the logistics industry to which it is hoped customers will go. CBOA found it useful as some potential customers did go but the Show was more useful in establishing links with others in the logistics trade, especially the ports. On the other hand, RWM is a gathering of the recycling and waste management industry – potential customers – who were interested in looking at solutions for their various problems, including logistics. Barges are more efficient users of fuel than lorries as barges face less friction, water being smoother for barges than road surfaces are for lorries. Figures vary according to fuel prices but we hear of fuel being 40% of total costs for lorries but 20% for barges. Barges produce about 75% less CO2 than lorries do, according to a report from the Tyndall Centre for Climate Change. The Association is pleased to support the Freight Conference being organised by the Freight Transport Association and and the Canal & River Trust in Leeds on 10th October. Please see Events page for further details and how to book. The Loadstar, a shipping industry trade journal, has reported that Belgium and the Netherlands are introducing the world’s first fully electric, emission-free container barges this month (below, centre) - operating from the ports of Antwerp, Amsterdam, and Rotterdam. 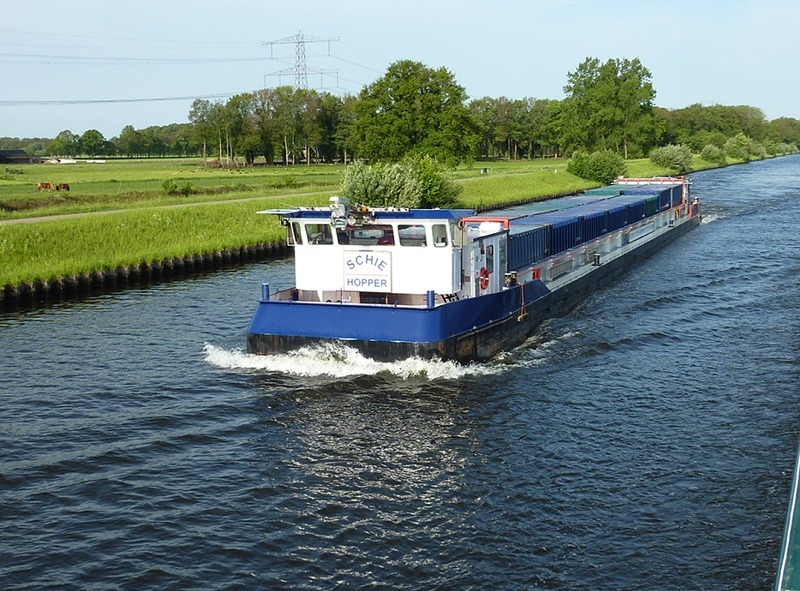 As the five barges, fitted with a power box giving them 15 hours of power, have no need for a traditional engine room, they have up to 8% extra space, according to their Dutch manufacturer, Port Liner (Van Meegen Group). Their electric motors will be driven by 20-foot batteries, charged on shore by carbon-free energy provider Eneco, which sources solar power, windmills and renewables. About 23,000 trucks, mainly running on diesel, are expected to be removed from the roads as a result. Their use alone could lead to a reduction of about 18,000 tonnes per year of CO2, it is claimed. The barges are being developed in the Netherlands with €7m in subsidies from the EU and additional funds from the ports involved. Port Liner believes it could produce about 500 barges a year to revolutionise the freight industry, although the electric motors and batteries could also be retrofitted into older boats. 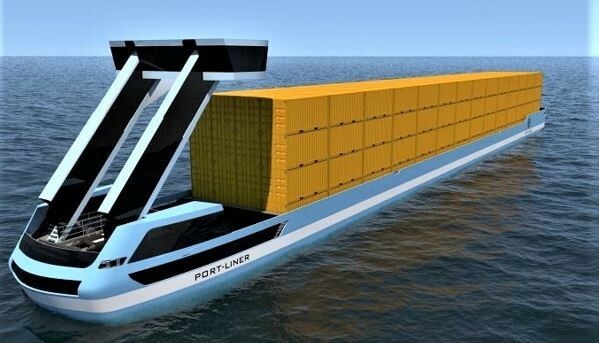 At a later date, six larger 110m-long barges, carrying 270 containers, will run on four battery boxes capable of providing 35 hours of autonomous driving. 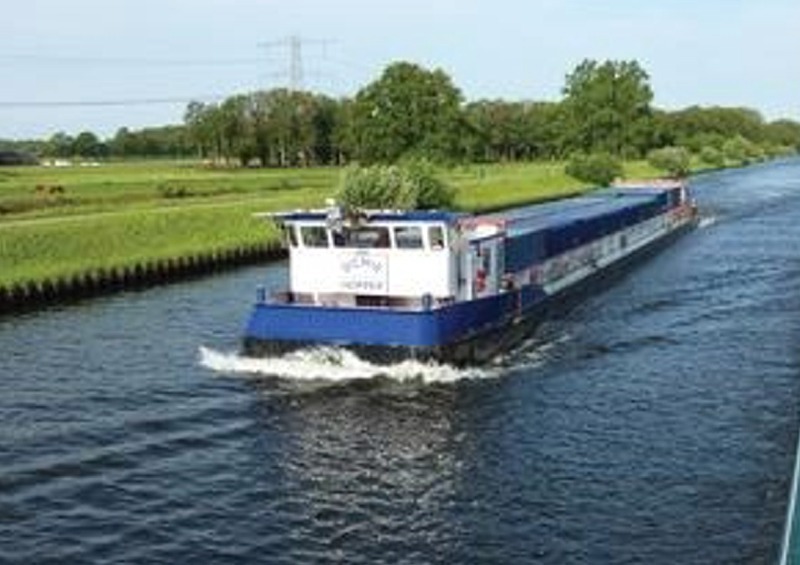 Portliner’s chief executive, Ton van Meegen, told the Loadstar that the barges would be the first in the world to sail on carbon-neutral batteries and that only the low bridges in the low countries prevented them from being loaded with more goods. The Commercial Boat Operators Association (CBOA), the national trade organisation for barge and other commercial craft operators on the UK’s inland waterways, today warmly welcomed the news that the West Yorkshire Combined Authority (“WYCA”) has agreed to provide £3.17m towards the building of a new wharf at Stourton on the Aire & Calder Navigation on the outskirts of Leeds as part of the Port of Leeds project. For some time, the Canal & River Trust, strongly encouraged by CBOA, has been reviewing building a new wharf at Stourton – with room for either one or two barges to be tied alongside at the wharf (depending upon demand). The site is well located in logistics terms, being close to the motorway and also rail connections. The new wharf would be able to handle sea-dredged aggregates brought by barge to Leeds from the Humber. Steel and timber products are also possibilities, along with other goods imported via the Humber ports. With modest improvements to the Navigation, barges would be able to bring containers to Stourton, thus relieving road traffic congestion on the M 62 and reducing pollution. 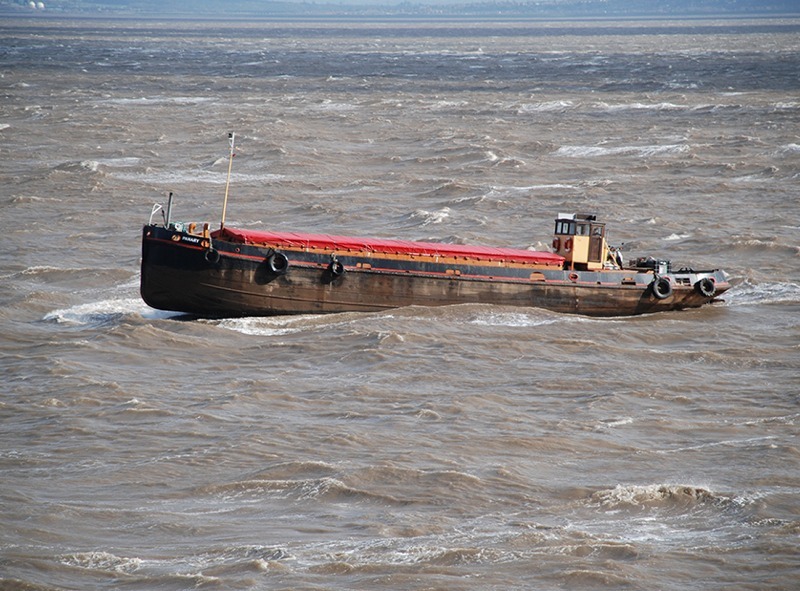 Existing barges can carry up to 550 tonnes each - the equivalent of 27 lorries carrying 20 tonnes. With the navigational improvements, it would be possible to bring across from Europe Euro-Class 11 barges which can take 650 tonnes. The Thames and London Waterways Forum has been set up by the Mayor of London to advise him on addressing strategic waterway issues in London. The Forum has brought together the London Waterways Commission and the River Concordat. The Commercial Boat Operators Association (CBOA) represents water freight carriage by barge on the UK's inland and estuarial waterways and is accepted by the Government as the representative industry body. The CBOA is the prime trade organization involved in sustaining and promoting freight carriage on our waterways for economic and environmental reasons. In several places the draft Strategic Transport Plan mentions the advantages and benefits of multi-modal transport for freight and modal shift to other than road means, which CBOA fully agrees with. Rail is extensively mentioned in many sections, however there appears to be little mention of the use of navigable waterways, either rivers or canals for modal shift. Sizeable commercial freight waterways exist in the Cheshire/Lancashire/Greater Manchester area and also the Yorkshire/Lincolnshire area. The Weaver Navigation, linking the Manchester Ship Canal to the industrial estates around Runcorn and to Northwich (600 tonnes). The importance of the waterways linking to Goole and thence to the Humber estuary, and secondly the Manchester Ship Canal linking the Port of Liverpool to Manchester cannot be over stated. The Humber estuary supports the ports of Hull and Immingham. These ports provide access and act as a gateway to the ports in the Baltic countries, Scandanavia and northern Europe. Significant amounts of freight are currently handled by the UK’s southern ports, which then travels overland to the north which is inefficient in transport terms and also energy consumptive. Greater use of the northern ports is highly desirable for this freight to be landed closer its destination. Removing both lorry miles and also rail miles for these freight movements is very desirable for emissions reduction and energy consumption reduction. Forward planning and investment is needed to expand the capabilities of these ports. Many of these waterways owned and managed by the Canal and River Trust are amply described by the Trust which is also submitting a response to your consultation, so I will not re-iterate the detail here but will refer to them similarly. In addition to the Trust’s waterways, the Manchester Ship Canal and Bridgwater Canal in the North West are owned and managed by other navigation authorities. 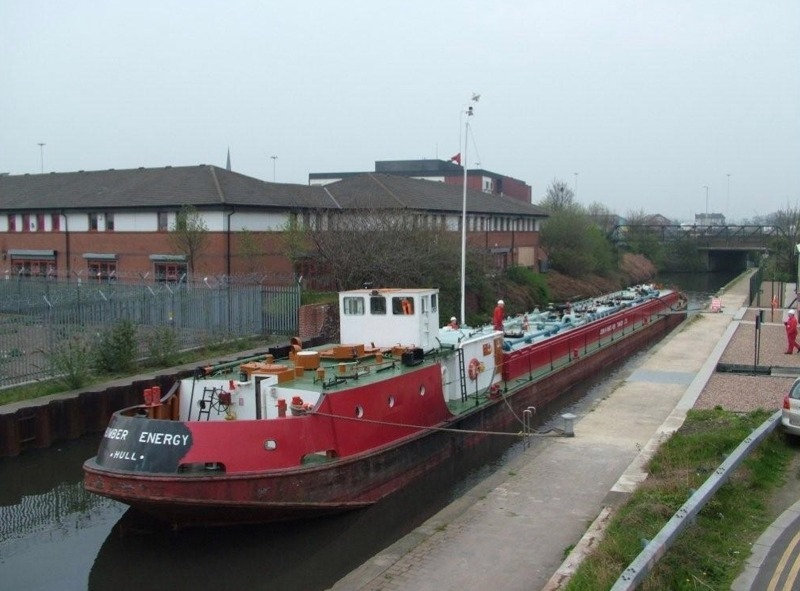 The Manchester Ship Canal is also vitally important and needs to be included in the issue of how water freight should be fully included and integrated together with the other transport means. CBOA fully supports the submission by the Canal and River Trust about use of waterways for freight. 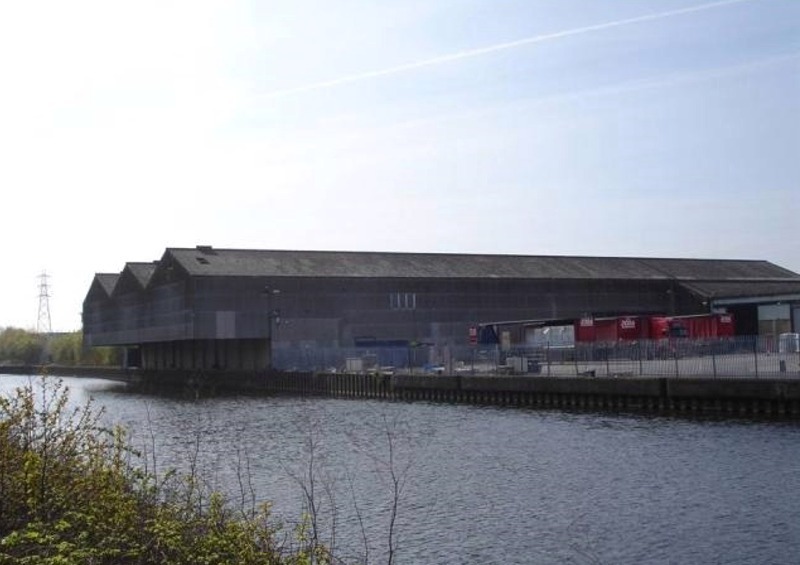 In Leeds, several wharves have protected status. These wharves are available for use and consideration should be given as to how they may be deployed for freight transport to reduce the dependence on road transport and its associated drawbacks. Other smaller waterways exist in all areas, which may also be suitable for smaller cargoes and niche market applications including opportunities for ‘last mile’ delivery within city areas – please see the later section on this. The section ‘Moving goods’ on page 34 and sub-sections of the draft Strategic Transport Plan mentions investment needed in Liverpoool2 and the Humber Ports. Rail is mentioned for freight interchange; however there is little or no mention of waterways in this section to destinations or originations inland, as mentioned herein above where the waterways pass through. CBOA would request that waterways are included for greater consideration with modal interchange. This may mean construction of additional wharves or road/rail interchange points. Of course the waterways do not reach all destinations or originations, but with careful planning there is no reason why a significant amount of cargo to these locations cannot be accommodated by water. Another benefit is that railways are not stretched beyond capacity around critical nodes such as the ports. As well as the bulk cargoes that can be carried, such as aggregates, demolition waste associated with new developments, including that associated with major infrastructure projects such as HS2, biomass/coal, steel, timber etc., other potential and current cargoes include oil products and other bulk liquids, recyclables, refuse derived fuels, steel, timber, palletised goods, grain and container goods. The road disruption for a large AILS movement is highly undesirable – so much better to transport the items by water where little or no disruption is caused. 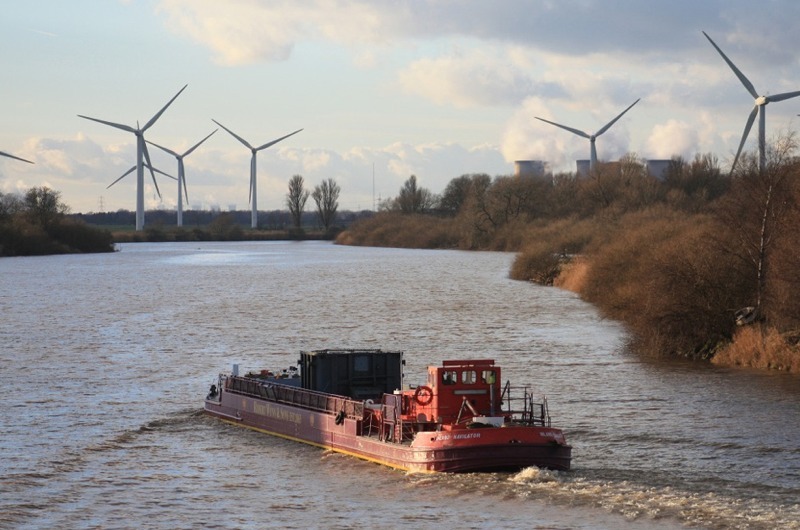 A good example of this is with power station sub-assemblies, where the power station is often beside a navigable waterway, such as at Ferrybridge near Knottingley on the Aire and Calder Navigation. 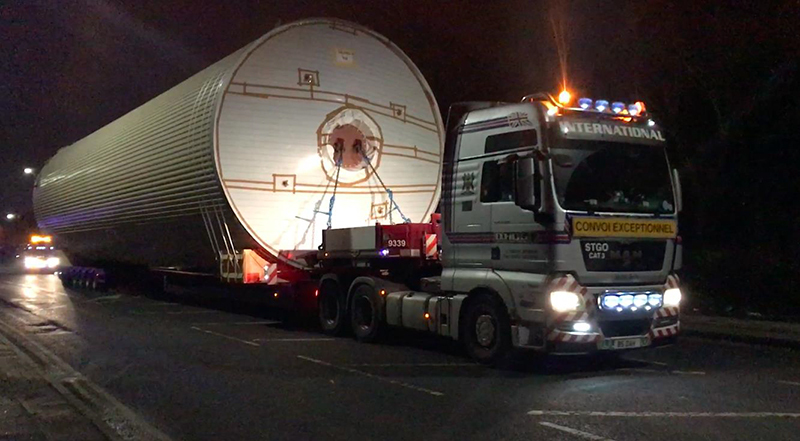 Large 300 tonne transformers were successfully taken by barge on the River Trent to Staythorpe power station near Newark-on-Trent two or three years ago, having arrived by ship at a Humber port, and have also been taken from the Humber up the River Ouse to Drax. This requires forward planning, with the planning consent being conditional upon using water transport where this is feasible for water side premises. Consolidation centres for local delivery of light cargoes or goods are mentioned on page 83 in the Innovation section of the draft Strategic Transport Plan; these can also be waterside, utilising water transport to deliver to them, thus avoiding the increasing use of the urban road network and avoiding the associated additional congestion. This scheme has already been implemented with success in Utrecht, Netherlands for delivery of beer barrels/cases and other goods. See http://www.bestfact.net/zero-emission-beer-boat-in-utrecht/ and also http://civitas.eu/measure/city-distribution-boat. Plans are also in hand to implement a similar scheme in Paris. ‘Last mile’ delivery is also mentioned on page 35 under ‘Supporting the international connectivity of the North’ and also on page 55. It can be seen that ‘last mile’ waterways delivery assists and complements the road transport system in reducing the congestion in critical high usage road routes within inner city areas. We would wish to see inclusion of ‘last mile’ water transport in these sections. Reduction of carbon and NOX emissions is regarded as “imperative” in the draft Strategic Transport Plan on page 35 in the section Moving Goods. Many reports have been provided showing that water transport is always given as providing a major reduction of emissions when compared to road, and also a significant reduction when compared to rail. · road transport used 0.8MJ. · Transport (excluding aviation) caused about 25% of the UK’s total CO2 emissions with road accounting for 22%; of this 40% come from lorries and buses. · Transport emissions contribute towards poor air quality. The Department of Health estimated that between 12,000 and 24,000 deaths each year arose from poor air quality. In 2011 the DEFRA consultation paper about transferring BW to CRT stated that "Freight transport by water can be cheaper than transport by road as moving goods by water can be more fuel efficient, leading to CO2 emissions that can be one-quarter the level of road transport", quoting the Tyndall Centre for Climate Change. It compares barge to lorry transport when carrying steel from Scunthorpe to Stourton, Leeds. In conclusion ASD’s expectation was that over a year there would be a 45% reduction in fuel used with the consequent reduction in emissions. This section in the draft Strategic Transport Plan should also include waterways for freight in terms of provision of wharves and modal interchange points with road and possibly also rail where this can be seen to assist with the overall design of the future transport plan freight routing. It may also be good forward planning to examine whether waterway expansion programmes would be beneficial. It is estimated that the cost of waterway construction could be significantly less than either road or rail. Would a trans-Pennine route linking the ports be beneficial? Aire & Calder Navigation improvement works were estimated in c 2003 at (only) £10 m. This would entail modest widening of parts of two locks, and the raising of five bridges to allow carriage of containers in Euro II size craft of up to 700 tonne capacity. Since then whilst costs have generally gone up, bridge raising costs have come down as more experience is learned from similar rail work. Also as the track is already there, no need for prolonged planning enquiries and so a "quick win" is possible. A map showing the navigable waterways is on the last page. The larger waterways mentioned above are shaded in blue. I trust that you be able to utilise CBOA’s information above in the review of the draft Strategic Transport Plan. If you need any further information I would be pleased to assist. 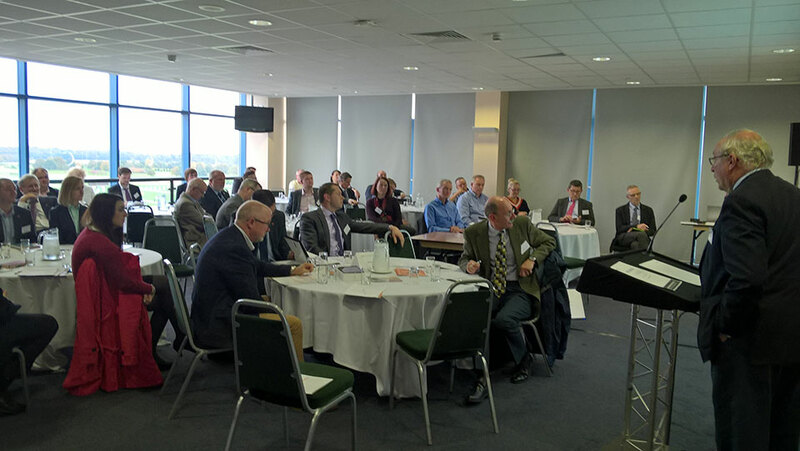 Some 60 people gathered at Doncaster Racecourse last November for the Freight Transport Association’s annual water freight conference, organised by their Freight by Water section. The speakers included CBOA’s chairman David Lowe and Lucy Hudson, Lead Officer – Freight & Logistics for Transport for the North. Warren Marshall, Peel Ports Group Planning Director spoke about the expansion of traffic on the Manchester Ship Canal and future plans, linked with the expansion of Liverpool’s capacity to take larger container ships and so offer an alternative to Felixstowe and Southampton. Warren told the audience that the Liverpool/Manchester container shuttle service was now operated by the 300 teu vessel THEA. Starting from 3,000 teu moved in 2009, the 2016 figure was 36,500 teu – an increase of over twelvefold. Tom Jeynes (Sustainable Development Manager, APB Humber) spoke about Associated British Ports’ hopes and plans for the future, including making use of the waterways to Leeds and Rotherham. He was followed by Chris Evans, a transport consultant engaged by Canal & River Trust , who spoke about their plans to develop the Port of Leeds, coupled with the advantages of using water freight. The second session was started off by Graham Dixon, Group Director of our Members Esprit Group. They have taken a lease of the Manchester Dry Docks site and have renovated the buildings and hard standing for warehousing and onward road delivery. Being close to the flour mills of both Allied Mills and Rank Hovis McDougall had enabled Esprit to store British grain prior to delivery to the mills. Graham emphasised his desire to receive water borne cargoes and showed pictures of abnormal indivisible loads being unloaded from ships – very large cylinders destined for a local brewery. Graham also delivered (on behalf of Antoon Van Collie who was ill) a speech about the Belgian based Blue Line Logistics new pontoon barges. These flat decked craft are designed to be used by goods on pallets; in builders’ bags; in skips; in roll-on/off containers. Ease of handling is a key feature and there is no need for expensive land based lifting gear. The session ended with a presentation about the use of oversize bikes and small electric powered vans for “last mile” delivery in congested urban areas. David Lowe spoke about the opportunities and challenges in the North and explained proposals for modest improvements which would enable Euro Class II barges to get to Leeds. They have a carrying capacity of 650 tonnes or 32 teus. The feeling was the conference had been effective. Of the 60 people present, over half were from companies of various sorts with the rest being drawn from navigation and other authorities and CBOA Members. It was nice that CBOA played a part in the organising of the conference as the majority of the speakers were suggested by CBOA personnel. 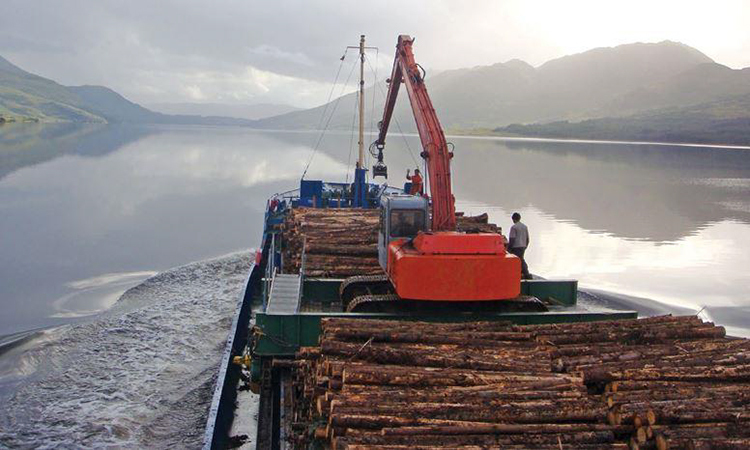 For many years waterway transport of timber has been advocated in Scotland and in 2015, Roland Stiven, the Timber Transport Forum’s Project Officer, made an information-packed submission to the Scottish Parliament. • the movement of timber from Glen Etive, after the loch’s jetty had been rebuilt, to Inverness via the Caledonian Canal http://www.seabreezes.co.im/index.php/news/coastal-commentary/1121-kanutta-in-the-canal. Baroness (65.0 x 10.7 x 4.0 metres, 1,450 dwt) has been well employed in coastal timber movements. The Caledonian Canal provides a shortcut between Scotland’s west and east coasts. Use of the Great Glen company’s little ships is saving thousands of truck miles on remote highland roads. Such ship movements are an essential part of a modern sustainable forest industry, important in large parts of remote Scotland. It recommends making ‘In-Forest’ road links to water and rail routes, constructing, improving and upgrading of informal roads, as well as improvement and upgrading short stretches of eligible minor public roads to enable timber extraction by rail and inland waterways. 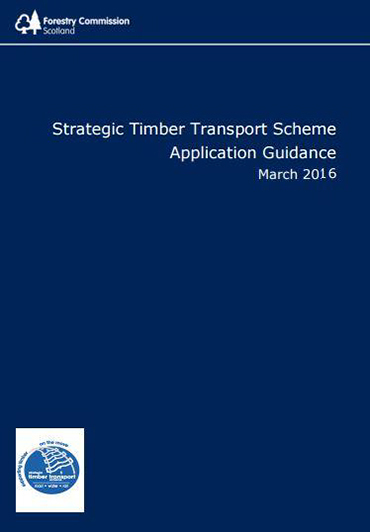 Investments will aim to reduce the overall environmental impact of timber transport operations by reducing road mileage and/or fuel consumption and a contribution to the development of non-road transport modes such as rail and water. 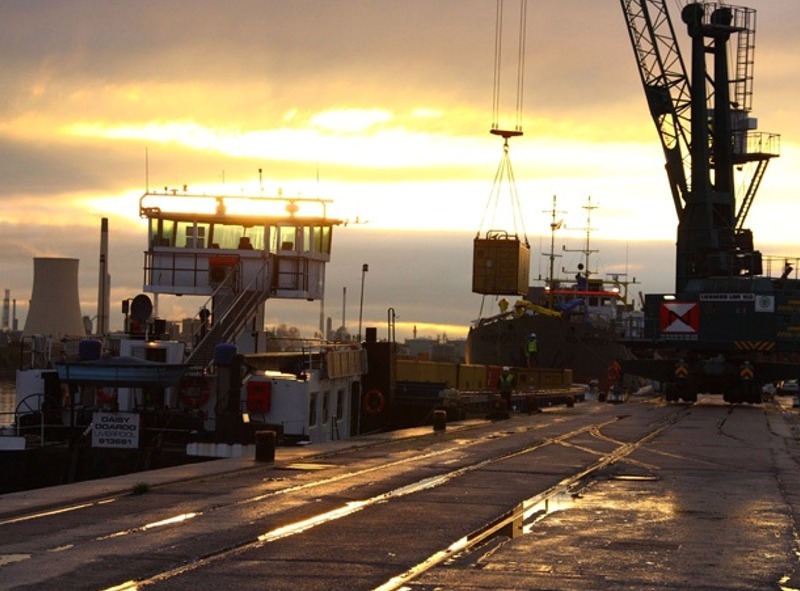 Awards under the Mode Shift Revenue Support scheme were mentioned as a possible source of funding, though the latest grant awards table lists no Scottish waterway freight grants. The Department for Transport gave awards from the Sustainable Distribution Fund, designed to support the carriage of freight by rail and water that would otherwise be carried by road. Support from this bid round is expected to remove up to 15,487 lorry journeys from the roads of Great Britain between January 2017 and March 2017 and achieve environmental and social benefits that result from using rail or water transport instead of road. Its Waterborne Freight Grant scheme is intended to assist companies with the operating costs, for up to three years, associated with running coastal and short sea shipping freight transport instead of road (where short sea/ coastal shipping is more expensive than road). However, following the January 2017 Bid Round , no English waterway freight grants were listed. Commercial boat operators and the Canals and River Trusts who wish to apply for such grants can learn more about the procedure here. The 27th April saw the CBOA hold its AGM at The Bond, Birmingham, as last year the year’s event was chaired by our President David Quarmby. The AGM received the Chairman’s annual report on the association’s activities during the year and approved the accounts. Following the official business of the AGM the meeting was addressed by three guest speakers. The first presentation was from Gerry Heward of Wood, Hall & Heward Ltd, he gave details of his company’s barge operations supporting civil engineering works and freight particularly in the London area, Graham Dixon of Esprit Warehousing & Docks spoke about his company’s investment in the wharfage and warehousing in Trafford Park and the opportunities he saw for growth and Louise Hall of the Shipowners P&I club/CTRL Marine Solutions closed on behalf of the guest speakers by addressing about her company’s technical, risk and legal services offered to both members and non-members. All three presentations were very informative and thought provoking, consequently, they were well received by our members and the presenters were thanked for their input to the success of the day. In addition to the guest speakers one of our members, Patrick Moss, gave a short presentation on the opportunities to develop the freight on the River Severn and the potential development of the Port of Worcester. This was followed by an update on progress of the development of the Port of Leeds by Chris Evans who is overseeing the project on behalf of the Canal & River Trust. Our President and Chairman were pleased to see so many members attend; those members that were unable to be at the event are encouraged to read the minutes which are also available on our website. 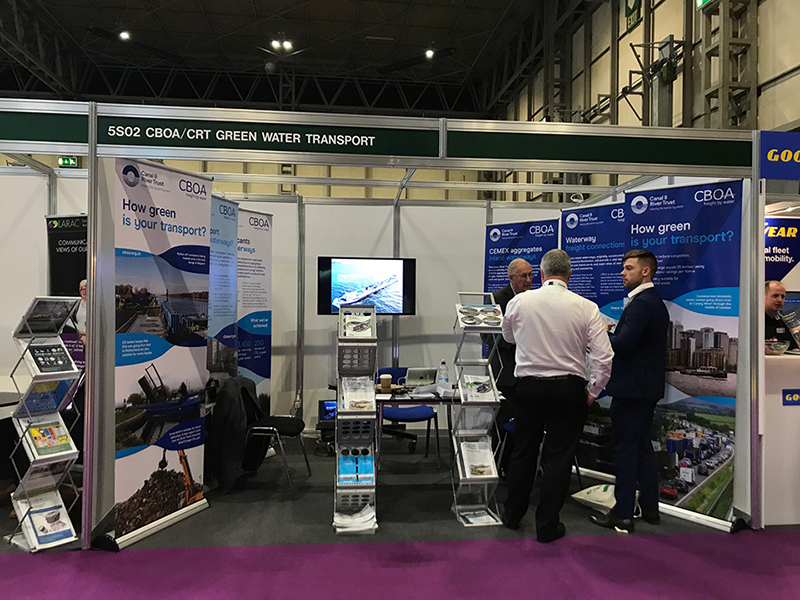 The CBOA, in conjunction with the Canal & River Trust, attended the Multi Modal exhibition at the NEC, Birmingham again this year. It is pleasing to report many new contacts were made within the logistics industry; these will be followed up by the committee in an effort develop new waterborne trades for our members. In addition to those who stopped and spoke to the team on the stand many visitors to the exhibition seemed fascinated by the new rolling presentation on freight on the inland waterways. The Commercial Boat Operators Association’s (CBOA) Award of Excellence was presented to Steve Dunn, Sales Director, and Mark Field, Marketing Manager (both of Exol Lubricants Ltd (Exol)) by Dr David Quarmby, CBE, the CBOA’s President at the Freight Transport Association/Multimodal Awards Dinner on April 4 2017 at the National Exhibition Centre. In 2016 Exol resumed deliveries of base oil from Hull to their waterside blending plant in Rotherham alongside the Sheffield & South Yorkshire Navigation. They receive up to 1,000 tonnes a week, carried by oil tanker barge. 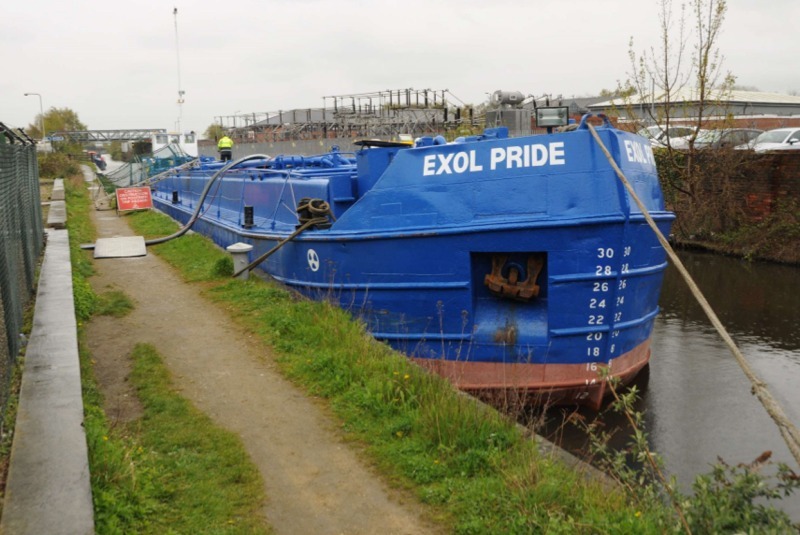 Exol’s commitment to the use of freight by water is shown by the fact the barge is named EXOL PRIDE and is painted in Exol company colours. 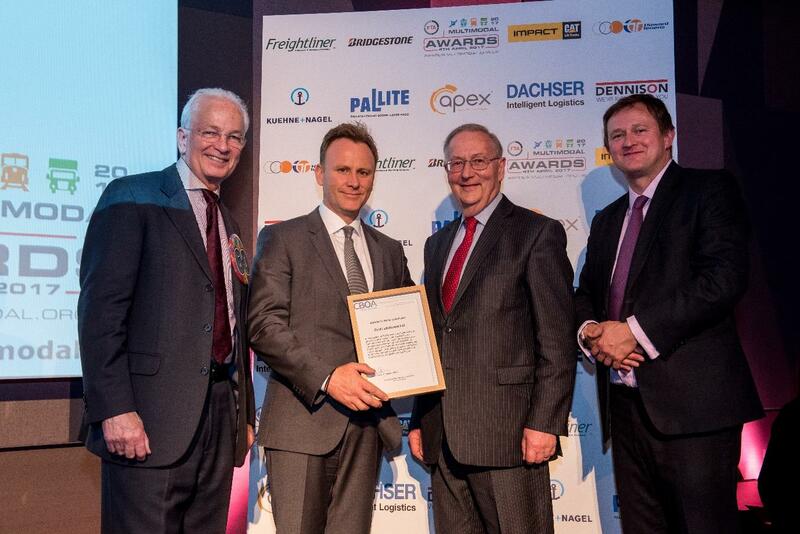 Photos below and attached show the Award being presented and the EXOL PRIDE, carrying about 500 tonnes of oil. CBOA is the trade association for companies which carry freight on the UK’s inland and estuarial waterways. CBOA members offer a one-stop service to advise companies on what can be done to take freight off the roads and on to water to capture both economic and environmental benefits. 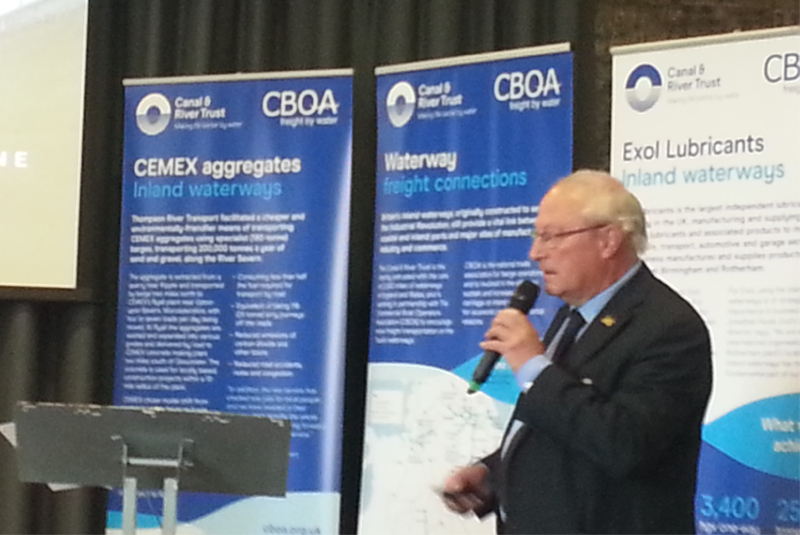 The CBOA periodically makes Awards of Excellence to mark a significant achievement in water freight. On this occasion, the recipient is Exol Lubricants. This article briefly covers the development of hydrogen as an environmentally good motive power source for transport, including use in barges and vessels of all kinds. Sixty years of research has been carried out into the production of hydrogen from waste and fuel cell powered electrical drives chiefly for vehicles. Birmingham is one of the first cities in Europe, along with areas of Belgium and North West Germany, to be progressing this technology. The hydrogen fuel cell works by combining the hydrogen with oxygen and burning or oxidising it. Low voltage electrical power is produced (about 0.7V per cell), and multiple cells are stacked to provide a useful voltage for the desired application. It is an environmentally friendly way of producing electrical power with minimal levels of toxic waste. The hydrogen has to be either stored locally or produced as required for the cells. In 2000, the Birmingham University's Centre for Hydrogen and Fuel Cell Research was formed, part of the university's School of Chemical Engineering. With its programme of research into hydrogen as a future energy source, the university has been working towards making a low and no carbon economy a reality, for both automotive and for other motive energy plants. In 2010, the boat Ross Barlow, pioneered by Birmingham University with fuel cell technology, made its longest voyage to date, of four days duration and 105 km length, passing 58 locks. The boat holds its hydrogen in powder form – metal hydride – which could offer a safer and cheaper use of hydrogen. In 2014, the University of Birmingham designed and developed a narrow-gauge hydrogen-hybrid locomotive, with electric drive to the wheels. On board lead-acid batteries stored the power during off peak power demand times. In September 2015 a zero-emissions refuelling station for hydrogen powered cars was built by ITM Power near the M1 at Rotherham. Electricity produced from wind turbine splits water into its constituent parts - hydrogen and oxygen. The hydrogen is then used for the fuel filling station. Some car manufacturers notably Toyota, Honda and Hyundai are developing hydrogen powered cars, with Toyota aiming for production of 30,000 cars annually by 2020. Removal of freight of the roads, increasing safety. Hydrogen fuel cell powered barges would need hydrogen refuelling stations at suitable locations. These locations would then need to be re-stocked periodically or provided with hydrogen produced locally perhaps. In November 2016 Germany introduced the world’s first passenger train powered by hydrogen - the Coradia iLint. If successful more will follow. Transport for London are now using eight hydrogen fuel cell single deck buses onto Route RV1, operating between Covent Garden and Tower Hill. Two more vehicles will join in 2017. The only emission from these buses is water. This week (Monday 30th January) saw the arrival of the first large ship into Trafford Park Docks, marking it’s re-opening after being closed for over 10 years. The 2300 tonne ship 'RMS Duisburg’ brought two large silo’s from Germany, bound for a Manchester factory. The Esprit Trafford Park Docks can handle vessels carrying upto 4500 tonnes of bulk goods or oversized freight which is too large for normal transport by road. Esprit have also refurbished two warehouses on the site upto food-grade standard, so freight can be stored at the docks, inside or outside, and gradually collected over a period of time. “Businesses need to start thinking ‘can our raw materials or finished goods be transported on the canal rather than by road?” Not only can goods be brought into Manchester, but those produced in Manchester can also now be shipped out via the Manchester Ship Canal. Equally freight doesn’t have to be international to use the canal. 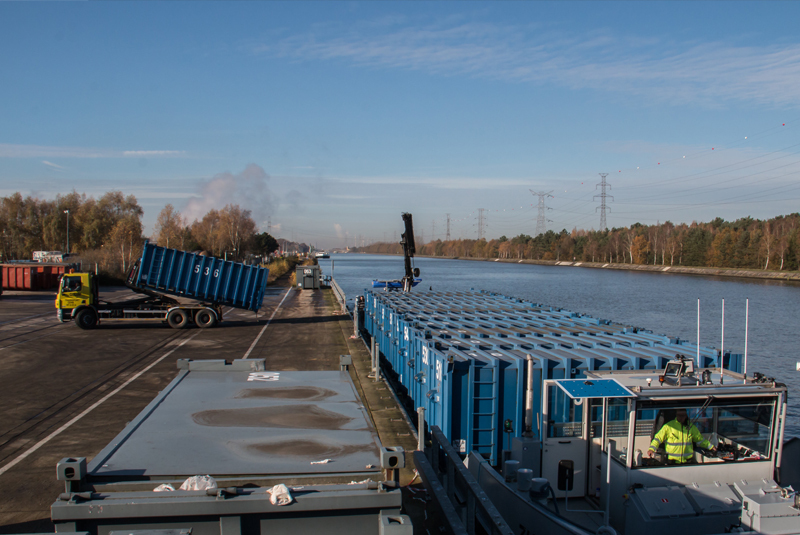 Esprit has recently signed an agreement with Belgian company Blue Line Logistics who operate smaller barges on inland waterways. These can be used for moving palletised goods between the many berths up and down the ship canal, utilising their onboard cranes for lifting pallets directly onto and off the quayside. In Belgium, many local authorities impose planning conditions requiring developers to bring their construction materials as near to the site as possible via the canals. The Manchester Ship Canal can now be used for ideas such as this, with Trafford Docks the ideal location, leaving only the final few miles for road transport. Peel Ports have recently opened Port Salford for freight carried in shipping containers, so now Esprit’s Trafford Park Docks has opened for bulk and oversized freight, the ship canal can cater for most types of freight. LLECP is a partnership between the 'Cleaner Air Boroughs' of Camden, King's College London, Hammersmith, Fulham, Islington, Lambeth, Lewisham, Wandsworth and industry partners across the demolition and construction sectors. In 2015, Air Quality News reported that the LLECP website, aimed at helping the construction industry to understand its impact on air quality and encourage pollution reduction measures, had been launched by King’s College London. The site notes that as emissions from road vehicles can significantly add to levels of local air pollution, developers with construction sites close to waterways or railways are strongly encouraged to assess the viability and feasibility for construction materials to be delivered or removed by these means, rather than by road. The benefit of this is the reduction in the number of trips made by HGVs on local roads, reducing local emissions. Even modern diesel or petrol powered plant items emit higher levels of PM and NOx than electric equivalents. Therefore, wherever possible, renewable, mains or battery powered plant items should be used. Science Daily says (drawing on material from the Swiss Federal Laboratories for Materials Science and Technology) one of the most efficient means of transporting freight is by water. It points out, however, that many vessels sailing today are powered by aging diesel motors fitted with neither exhaust cleaning equipment nor modern control systems. The converted hydrogen-fueled barge "Ross Barlow" with the Empa-developed hydride storage tank.Credit: Image courtesy of Swiss Federal Laboratories for Materials Science and Technology (EMPA). 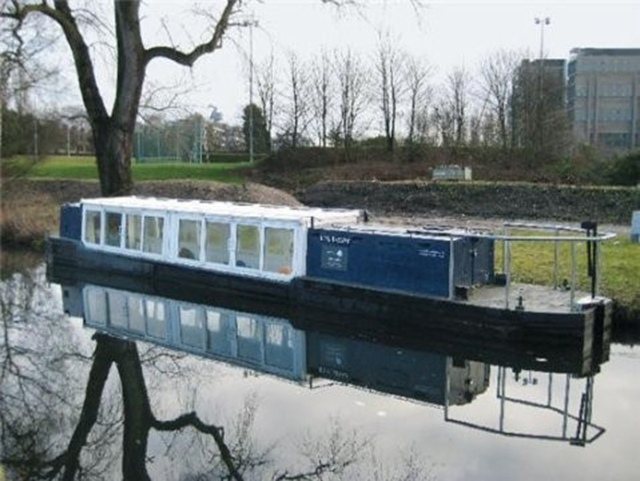 The EMPA report describes the University of Birmingham’s ‘ambitious trial’, converting a canal barge to be the first in the world to use hydrogen fuel. In 2010 the converted boat, the "Ross Barlow," made its longest voyage to date, of four days duration and 105 km length, negotiating no less than 58 locks. The boat holds its hydrogen in powder form - metal hydride – which could offer a safer and cheaper use of hydrogen. Cenex, the UK’s Centre of Excellence for Low Carbon and Fuel Cell technologies, supports the early market development for low carbon vehicles including electric, hybrid, bio-methane and hydrogen powered vehicles. Cenex also works with clients to increase the use of alternative fuels in the UK through the addition of infrastructure including electric vehicle charge points, gas and hydrogen stations. Will Cenex extend its remit to increase the use of alternative fuels on vessels sailing on our rivers and waterways? 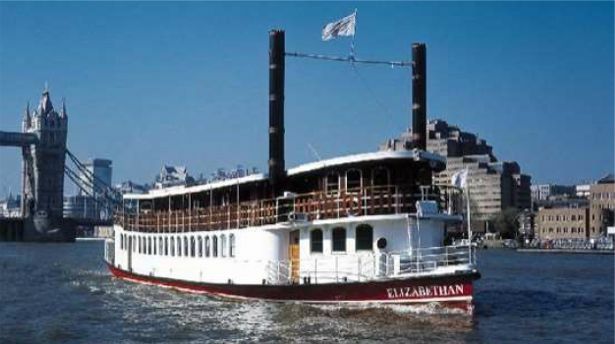 Elizabethan, a replica Mississippi paddle steamer, at Butler’s Wharf Pier, Shad Thames, London, chaired by its author, Alex Veitch, FTA's Head of Global Policy. It may be downloaded here. The report offers the Thames as a case study for other waterways across the country. The importance of safeguarding wharves from development is one of the key issues explored. The latest information on water freight services in the Thames region is given, the Association’s proposals to grow the sector are recorded and the policy and regulatory barriers impeding growth outlined. As Alex Veitch said: “Inland water freight can make a significant contribution to alleviating road traffic congestion in London and other major cities across the UK, but there are many planning and regulatory barriers that prevent those moving freight from capitalising on the benefits”. Information given in the publication gives weight to the proposal for the establishment of a national Strategic Water Network to develop a more coordinated approach to investment and planning. Mr Veitch concluded: “Members of Freight by Water are keen to engage with industry partners and decision-makers to develop this concept and make it happen.” He encourages the new Mayor of London to continue his predecessor’s commitment to maintaining wharves in order to grow and develop the inland water freight sector. CBOA is delighted that Exol lubricants have chosen to remain with barge transport for deliveries of base oil from Hull to Rotherham. CBOA member Mainmast Ltd has taken over the contract, renamed one of its 600 tonne tanker barges ‘Exol Pride’ and painted it Exol house colours this cementing the relationship between the customer and the waterways. Exol expect the barge to make one or two deliveries a week and thus avoid the use of lorries. The barge journey covers 65 miles and takes between 10-12 hours. This means the whole cargo is delivered more quickly than if the barge crew drove lorries. Furthermore, utilising the figures produced by the Tyndall Centre for Climate Change barges produce only 25% of the emissions of those from lorries. 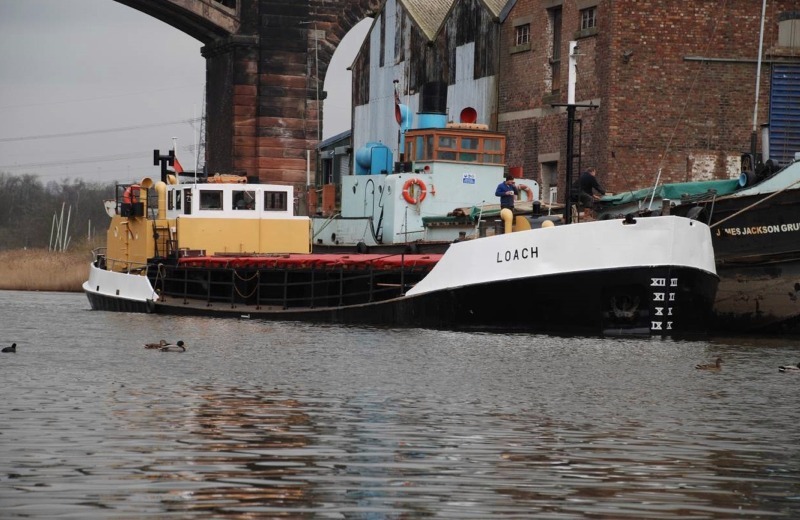 David Lowe, Chairman of the CBOA, said ‘the barge represents 18 heavy goods lorries, use of the barge saves time, avoids pollution from lorry engines and also helps reduce road congestion, particularly on the roads around Exol’s Rotherham depot. The CBOA has been pleased to assist the parties (Exol, Mainmast and the Canal & River Trust) with facilitating this project. It is pleasing to report that the Commercial Boat Operators Association’s presence at this year’s Multi Modal has been another complete success. A number of enquiries were received, these have been passed on to members that possess the relevant experience and boats. In addition to these the opportunity was taken to distribute our new and out and spread the word that the UK Inland Waterways are open and ready for business. Thanks go to those committee members, including our President David Quarmby CBE, who took the time to man the stand over the three days. 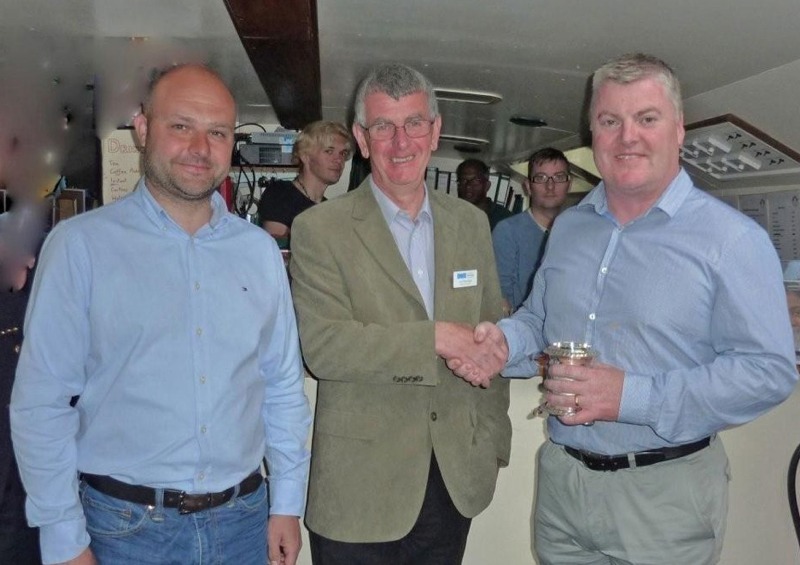 At the associations recent AGM we received three presentations; the first from Antoon van Coillie of Blue Line Logistics, this was followed by Dr Tom Cherrett of Southampton University with the final one by Steven Mears of Keel Marine. As those that were at the meeting will confirm they were very informative and thought provoking, with this in mind we're pleased to be able present them here again. The 21st April saw the CBOA hold its AGM at The Bond, Birmingham, this year’s event was chaired by our President David Quarmby. The AGM received the Chairman’s annual report on the association’s activities during the year, dealt with the re-election of Committee members and approved the accounts. After the business of the AGM in the morning, the afternoon session was addressed by three guest speakers. The first presentation was from Antoon Van Coillie of Blue Line Logistics, he gave details of his new design of barge operating on the Belgian waterways and the types of cargo they are handling, Dr Tom Cherrett of Southampton University followed up by giving information about a floating depot trial he is involved with in Amsterdam and Steven Mears of Keel Marine closed the afternoon sessions by giving his thoughts on the design of replacement inland waterway vessels. All three presentations were very informative and thought provoking, consequently, they were well received by our members and the presenters were thanked for their input to the success of the day. Our President and Chairman were pleased to see so many members attend and take advantage of the change of format. Those members that were unable to be at the event are encouraged to read the minutes which are also available on our website. The Commercial Boat Operators Association (CBOA), the national association for barge operators, today called on the Northern Powerhouse authorities to look at a new canal across the Pennines as part of their freight strategy. The Commercial Boat Operators Association is pleased to announce the appointment of Dr David Quarmby CBE as President to succeed the late Sonia Rolt. 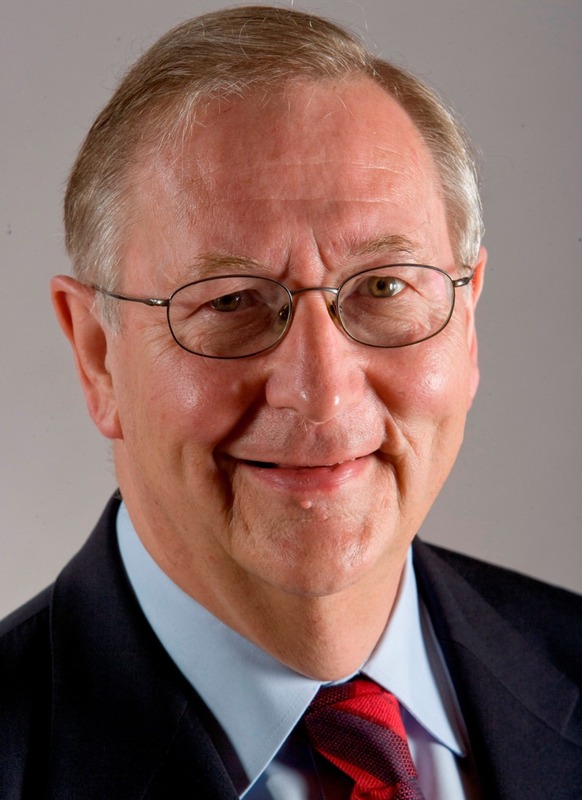 David Quarmby is chairman of the Canal and River Trust’s Freight Advisory Group (FrAG) and led the development of a policy for waterborne freight and the commercial waterways, since adopted by CRT in 2014. He is now a member of the CRT’s Freight Steering Group, created to take forward the FrAG proposals for Priority Freight Routes. David is widely known for his long career in transport and logistics, with 39 years’ board level experience in government, public agencies and the private sector. Since 1996 his appointments have included chairman of the Strategic Rail Authority and of the Docklands Light Railway, and Board Member of Transport for London; he has been a director of consultancy Colin Buchanan, and chairman of the RAC Foundation; he was President of the Institute of Logistics in the 1990’s. Prior to 1996 he was Joint Managing Director of Sainsbury’s, and earlier in his career Managing Director of London Buses. David is a native of Yorkshire, born in Halifax and brought up in Huddersfield; he took degrees at Cambridge and Leeds Universities, and has now lived in London for over 40 years. David is no stranger to the inland waterways: with his wife and family – and often with friends – David has enjoyed over 20 narrow boat holidays over the years. The report envisages that every opportunity should be taken for freight to make its way to urban areas by rail or water, either directly into those areas, or into the major distribution parks that serve them. It argues that those distribution sites should be located so that it is practical for goods to travel the last mile(s) into urban centres using zero/low emission modes. These last mile journeys should be achieved as safely, unobtrusively and with as little environmental impact as possible. Policy ideas that could assist in achieving this vision are explored, including making more use of city rail stations as out-of-hours freight hubs, a last mile innovation challenge fund and improving vehicle design. It concludes that a broader, national strategy for freight would assist in providing leadership and direction for the industry and its stakeholders. Exol Lubricants is hitting the small screen this month with an appearance on ITV’s prime time programme Barging Round Britain with John Sergeant. 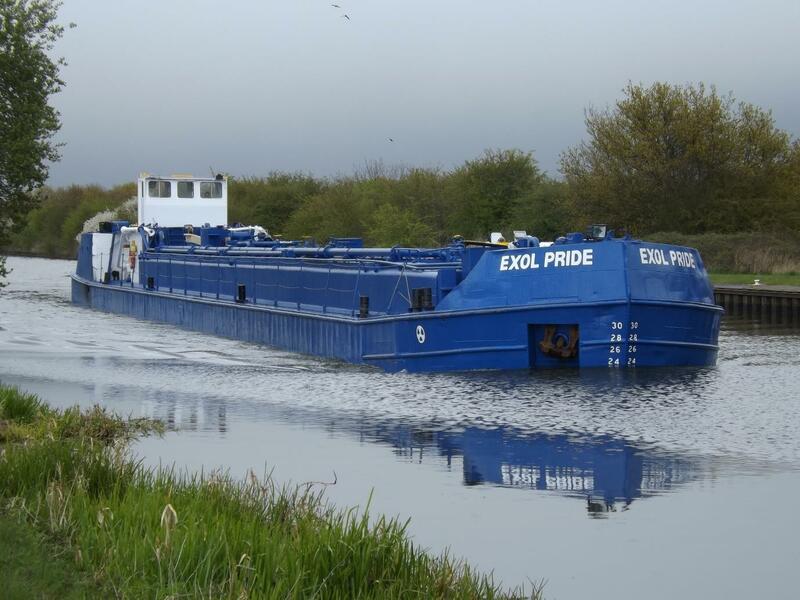 Exol makes effective use of the waterways and canal networks, regularly transporting 500 tonnes of raw material – equivalent to more than 20 road tanker deliveries – from Hull docks to its bulk blending plant in Rotherham. In episode three, which is to be aired on Friday 27 February at 20:00, programme host John Sergeant joins the Exol team on the Humber Princess (approximately 200 feet long), led by Skipper Duane Ball, and travels along the river Humber before disembarking at Goole. Barge transport is more energy efficient, produces less air pollution with lower emissions and is safer overall, with fewer accidents, fatalities and injuries. Where road travel is essential, Exol maintains one of the most economical fleets on UK roads, having recently invested £1.5million in new Scania trucks. Steve Dunn said: “It was great to play a part in Barging Round Britain as it gave us another opportunity to highlight our use of the waterways, which is vitally important to the running of our business. Gerald Whiteley, of CBOA members Humber Barges Ltd, accompanied John Sergeant on his journey up the Aire & Calder and John expressed great interest in and support for increased freight use of the inland waterways. 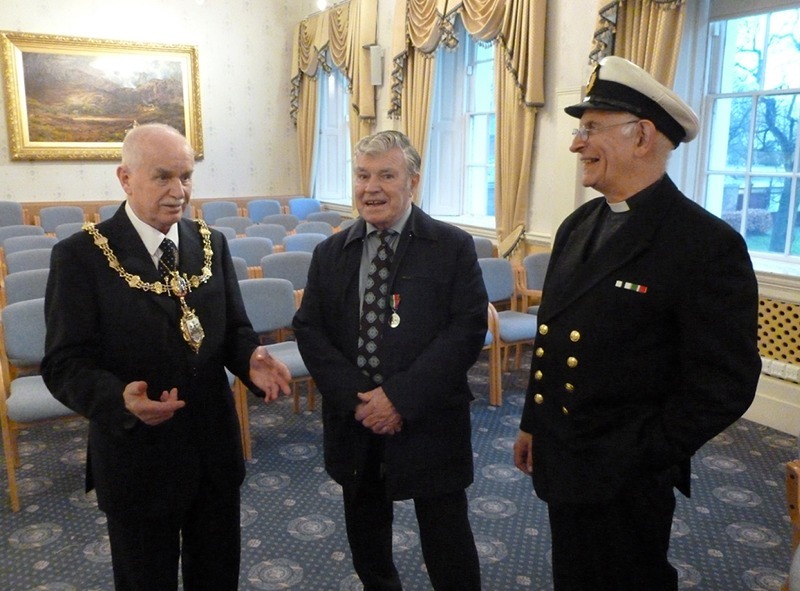 Captain Len Clarke was honoured to receive the Merchant Navy Medal in a presentation at Warrington Town Hall last week. He is in illustrious company as in 2014 only five Captains received the award, two of which were to the Captains of Cunard Queen Mary II and Queen Elizabeth. Len first went on the river Mersey as a young lad with his Father who was Captain of the J. Fairclough & Sons motor barges Pater and Panary. He began work at 15 as a deckhand with John Harker’s barges on the Mersey and was promoted Captain when he was 21. In 1975 he moved to Allied Mills at Bank Quay Mill Warrington and became Captain of their newly acquired motor barge Humber Trader. This traded with Panary bringing wheat cargoes from Liverpool up the Mersey and Manchester Ship Canal. The boats then locked down again through Walton Lock and back into the Mersey for the final leg of the trip to the mills at Warrington. In 1984 Allied Mills sold out their rights to use Walton Lock to the MSC, enabling MSC to close the lock, although a legal right of access to the derelict lock still exists. Humber Trader and Panary were sold by Allied and Len became Owner/ Captain of Humber Trader. He began trading to Frodsham for Frodsham Lighterage, later Viaduct Shipping, carrying wheat for Nelstrop’s Mill. After Humber Trader moved to Yorkshire, he continued in the grain trade to Frodsham as Captain of Panary, his Father’s old boat. In 2013 after a phenomenal 59 years on the river in he retired from commercial barging. However he can still be regularly seen afloat on the River Weaver and narrow canals aboard his immaculately maintained classic motor boat Jacqueline. 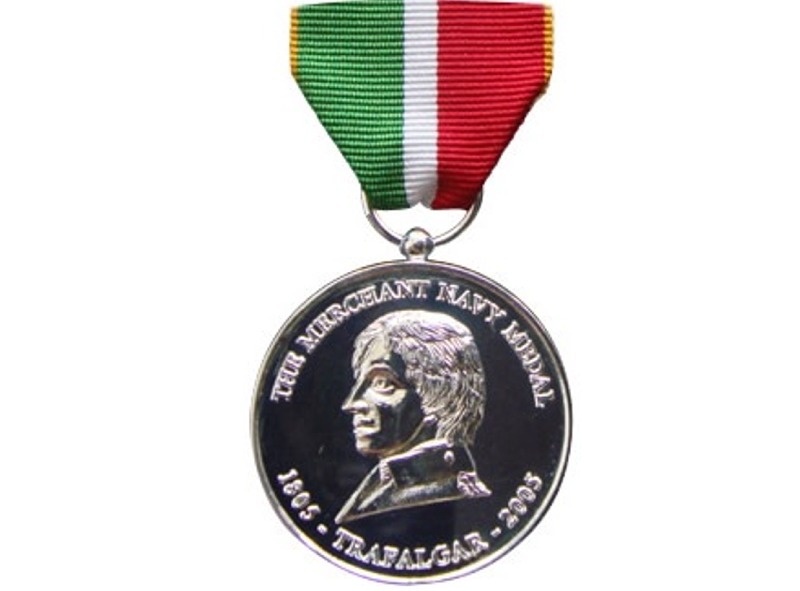 The medal citation reads, CAPTAIN. J.L. CLARKE, lately Master PANARY (Viaduct Shipping) for services to lighterage on the Mersey and to historic vessels on Merseyside. The Freight Transport Association, supported by the Canal & River Trust and CBOA held a water freight conference in Wakefield in November. Dr David Quarmby (Chairman of the CRT Freight Group) outlined the Trust’s freight policy, highlighting the decision to promote three waterways radiating from the Humber as ‘Priority Freight Routes’. CRT Trustee and CBOA committee member John Dodwell then detailed the opportunities made possible by the policy in an up beat presentation. 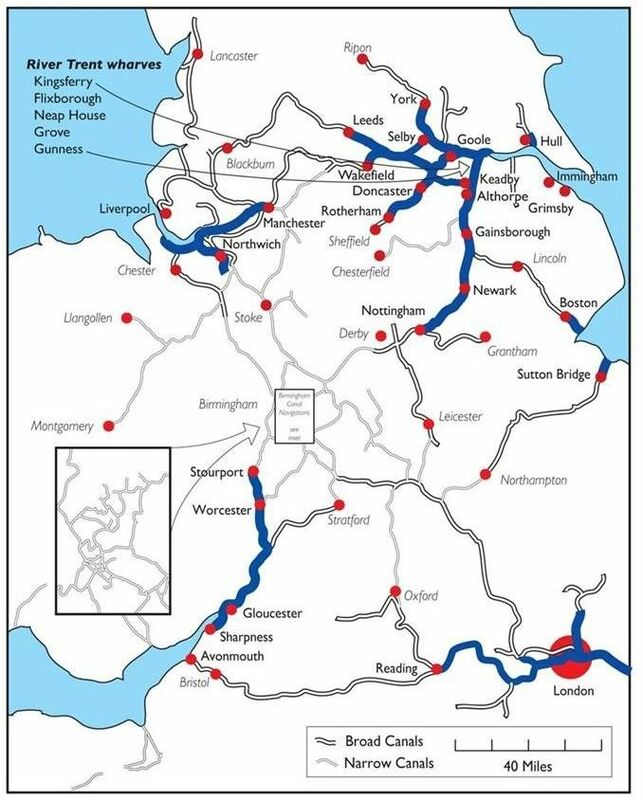 CRT Trustees had accepted the Advisory Group's recommendations to have a pro-active freight policy and about concentrating on developing freight on the larger waterways in Yorkshire whilst not ignoring others such as the Trent, Severn and Weaver. We are very sorry indeed to pass on the sad news that our President had passed away at 3pm yesterday afternoon, 22nd October, in Gloucester Hospital, where she had been for about two weeks. Hopes that she might have her wish of dying in her own home faded when her condition deteriorated over the weekend. Sonia was a great supporter and served as President of CNOA (later CBOA) from formation in 1990. She was also, however, a remarkable woman in her own right: a former Vice-President of the IWA, an author, campaigner and recipient of the OBE in 2010 for services to industrial archaeology and heritage. Sonia Rolt was born Sonia South. With no previous experience of or interest in canals when World War 2 was declared, Sonia became one of the famous ‘ Idle Women’ working narrow boats on the Grand Union Canal and connecting waterways. Sonia married a working boatman, George Smith, and stayed on the canals after the war. She met Tom Rolt at a screening of Painted Boats in 1945. Tom was an engineer and writer and his book ‘Narrow Boat’ (published in 1944) has been credited as being the catalyst for the formation of the Inland Waterways Association in 1946. Tom and Sonia were active within the IWA in the early years and played a major part in securing the future of the system, some of which was under threat of abandonment. Although the IWA campaigned for multi-use of the waterways Tom and Sonia were especially interested in and keen to see continued use for the carriage of freight. Sonia and Tom married, had two children and moved to Tom’s childhood home, in Stanley Pontlarge, where Sonia still lived until the end of her life. Her love of historic buildings led to her work as a furnisher and librarian for for the Landmark Trust and later, the National Trust, and she has been an active member of the Society for the Protection of Ancient Buildings (SPAB) for many years. In recent years Sonia edited and wrote introductions to several of Tom’s books – and in 1997 she wrote A Canal People, The Photographs of Robert Longden. The Commercial Boat Operators Association (CBOA) has made an Award of Excellence to Peel Ports in recognition of the achievements made in recent years in increasing the inland freight and port handling capabilities on the Manchester Ship Canal which is owned by Peel Ports. The wording of the certificate is “Award of Excellence - 2014 – Peel Ports - In recognition of the increased tonnages on the Manchester Ship Canal and the positive approach to encouraging and developing new barge traffic at Runcorn Docks”. 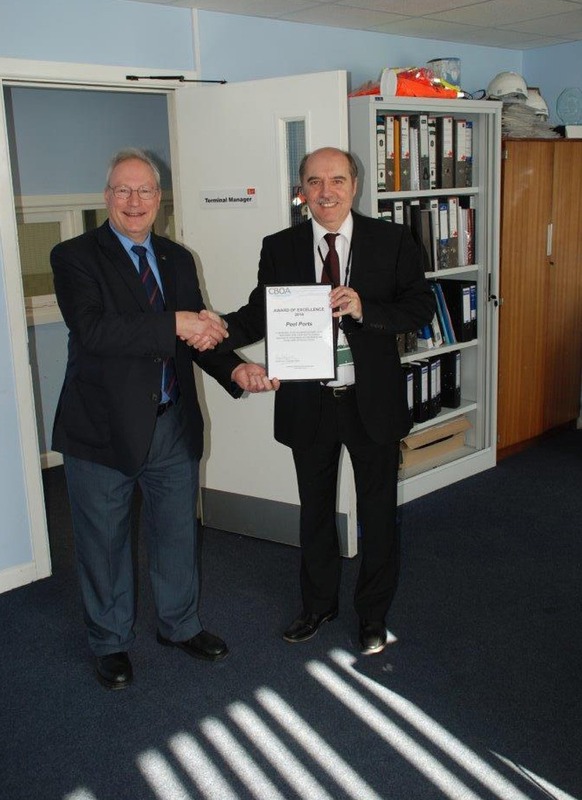 CBOA Chairman David Lowe presented the award on the 11th March at Runcorn Docks to John Rutherford, Terminal Manager Bulk MSC, due to his diligence, energy and enthusiasm. Since Peel Ports began moving containers from Liverpool to Manchester, they have been rewarded by seeing trade increase significantly. Users include Tesco, Kelloggs and Princes Foods. CBOA has been much encouraged by the start of enabling works for Peel’s planned container terminal at Salford at the Manchester end of the Canal. John Rutherford’s help has been appreciated in establishing Runcorn as a centre to handle grain brought by barge from the Seaforth Grain Terminal in Liverpool Docks. 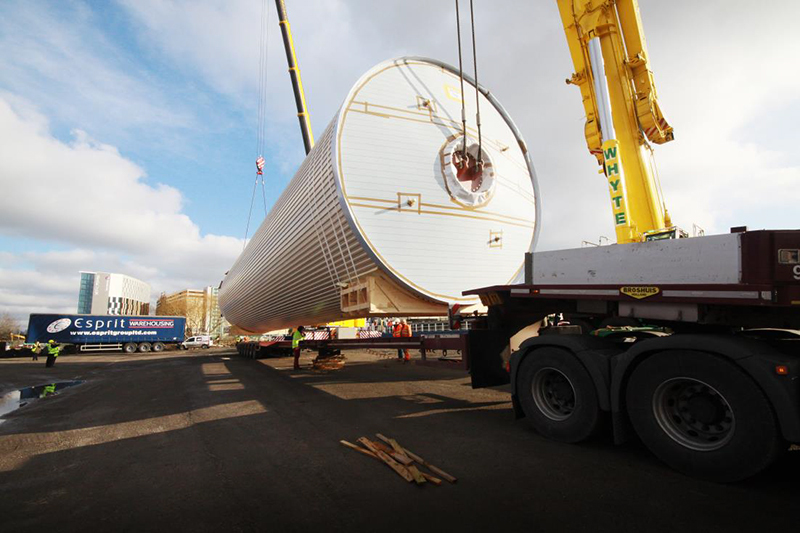 This tonnage – destined for a customer in Stockport has doubled in recent years. The Commercial Boat Operators Association (CBOA), the trade association for the barge industry, today welcomed the announcement that the Canal & River Trust (CRT) is setting up a group to investigate greater use of its Yorkshire waterways for carrying freight, including reviewing what infrastructure improvements would be necessary for use by larger barges, so enabling greater payloads and the carriage of containers. The CRT group’s work will include exploring market potential, including with port operators; looking at what wharf and supporting industries may be required; and what support or grants could be available, including from the EU and local enterprise partnerships. CBOA also welcomes the CRT statement that whilst concentrating on the Yorkshire waterways it will continue its support for freight on other commercial waterways at its present levels and will work with commercial firms wishing to develop new services; and that commercial craft on non-commercial waterways are welcome users. The Ouse from Goole Railway Bridge (where the Trust’s jurisdiction starts) to Barlby (Selby). Whilst concentrating on the Yorkshire waterways, the Trust will continue its support for freight on other commercial waterways at its present levels and will work with commercial firms wishing to develop new services. 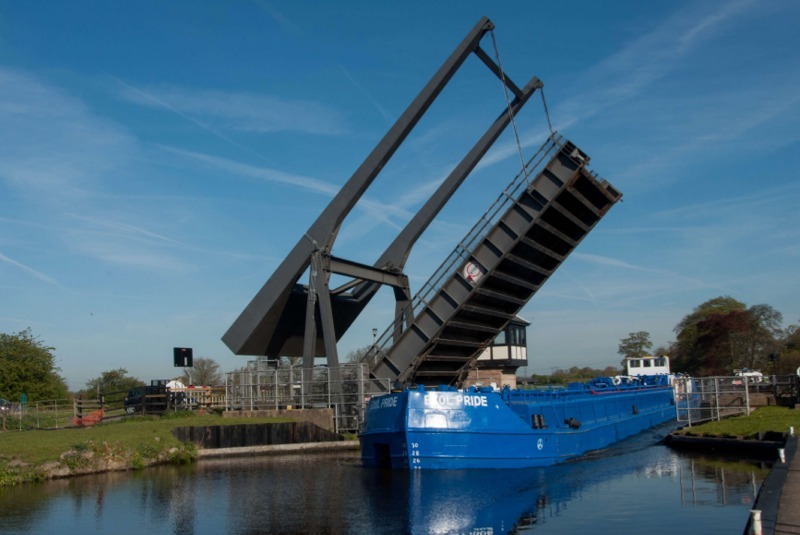 The Canal & River Trust is today publishing a report from its Freight Advisory Group into the current and potential future role of commercial inland waterways to carry freight. The Group recommended further investigation into ‘Priority Freight Routes’ (the designation of certain navigations in the North East that link to the Humber Estuary) where there is the opportunity for these waterways to be used for sustainable freight transport. The Trust welcomes the Advisory Group’s recommendations and has established a director-led steering group to fully investigate the viability of the designated Priority Freight Routes, including exploring market potential with the major port operators. This work will also involve reviewing what infrastructure work might be necessary to remove obstacles to larger barges, so enabling larger payloads and the carrying of containers. The steering group will also look at what wharf and supporting facilities may be required and what support or grants could be available including from the EU and from local enterprise partnerships. 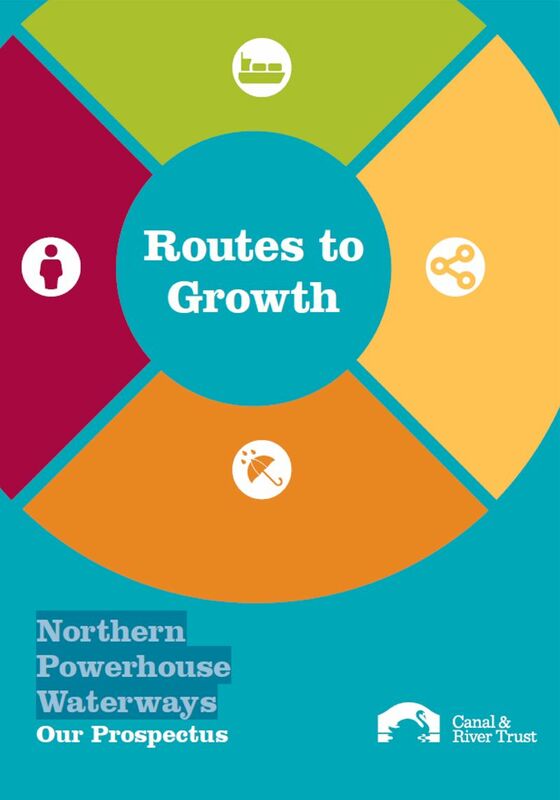 A conference in late spring to launch the report and seek a range of views will be organised in Yorkshire in partnership with the Freight Transport Association, to which the Local Enterprise Partnership, West Yorkshire Combined Authority, shippers, developers, operators, customers and logistics professionals will be invited. The Freight Advisory Group, chaired by David Quarmby, is made up of professionals from the waterways, transport and logistics industry. David comments: “I am pleased that our report and recommendations have been welcomed by the Trust. “What is clear is that the circumstances of each of the Trust’s ten commercial navigations are unique and very different from each other – different in their recent history of traffic and commodities, different in their connectivity to potential markets, different in the dimensions and draughts of vessels they can take, and different in the dredging and bank protections costs of making them fit for freight. There can be no ‘one size fits all’ approach to formulating policy for the ten waterways, or even for all sections of the same waterway. The Commercial Boat Operators Association has presented Canal and River Trust Chief Executive Richard Parry with a cheque for £250 towards the Trust’s National Flood Appeal. ‘The donation recognises the excellent relationship between the Trust and the Association. Although some of the waterways most affected are not used by CBOA members we recognise that repair work will inevitably draw funding away from work that does affect our members such as vegetation management, dredging, lock repairs etc. 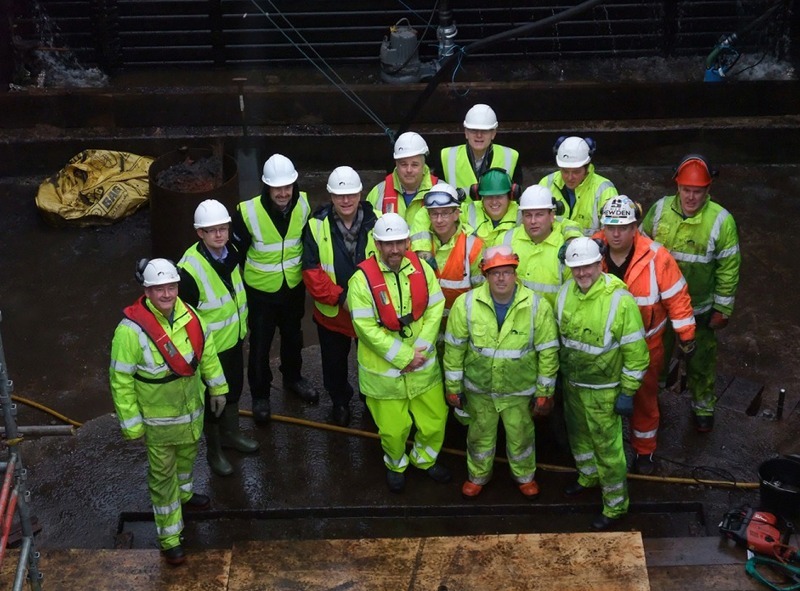 CBOA Chairman David Lowe ( a member of the CRT NE Waterway Partnership Board) joined CRT Trustee John Dodwell, Waterway Manager Jon Horsfall, and Freight Planner/Harbourmaster Stuart McKenzie for a visit to two stoppages which were taking place in February. Following extensive consultation with CBOA and our member John H Whitaker (Tankers) Ltd the stoppages at Aldwarke and Sprotbrough were re-scheduled to coincide so as to reduce the time the navigation would be closed and minimise inconvenience to Green Line Oils whose Rotherham works is supplied by oil from Hull docks by barge on a weekly basis. Jonathan Hoole (Operations Director) and Richard Ellis (Operations manager) from Green Line Oils (Exol Lubricants Ltd) joined the group at Aldwarke Lock. Jonathan explained that the barge deliveries were essential to the success of the Green Line operation for various reasons, including restricted access for lorries to the Rotherham site. It was anticipated that the deliveries would continue by barge for the foreseeable future and that there might be other opportunities to use inland waterway transport. 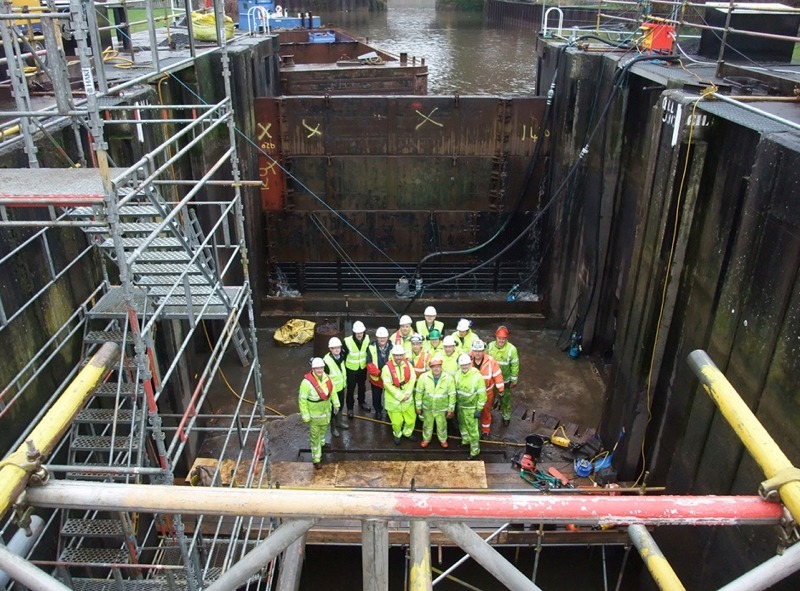 Photos (by Charlotte Burnett-Wood, CRT’s Principal Waterway Engineer NE) shows the visitors with CRT staff in the bottom of Aldwarke Lock. Helm Fertilizer Great Britain Ltd (Helm) has signed a 10 year agreement with PD Ports to operate a blending and bagging facility for its fertiliser imports at the Port of Howden. The Port of Howden, which is owned and operated by PD Ports will also provide the stevedore service for this new agreement with the first vessel call expected in early 2014. Once received, the fertiliser, which is being imported from Europe and North Africa will be stored at the port before being blended and bagged ready for onward distribution. The arrival of Helm at the port will see an initial investment of over £500,000 spent refurbishing one of PD Ports’ existing on site warehouses, covering some 68,000 sq ft. With anticipated volumes of over 50,000 tonnes per annum, the Port of Howden will become the central UK hub for Helm who has previously used multiple ports of entry to import fertiliser. Jerry Hopkinson, PD Ports’ managing director, bulks and port services, said: “We are delighted to have signed a long term agreement with Helm, which will provide a huge boost to the volume of traffic through the port. This new partnership also provides an excellent opportunity to expand the range of activities undertaken at the port as well as further secure its long term future and provide additional employment opportunities once fully operational. "Howden was chosen by Helm to consolidate its imports based on its location and close proximity to rural regions such as Lincolnshire, as well as the excellent transport links to and from the port. Having previously only imported fertiliser in bulk for onward distribution, Helm will make a significant investment in a state of the art blending and bagging machine that will be one of the first of its type within the UK. This will enable Helm to add further value and greater efficiencies in its supply chain by bagging fertiliser on-site before onward distribution. This new machinery is capable of ensuring a precise mix of product, complemented by the first rotary screening system, to remove dust and oversized particles, ensuring the size, quality and consistency of the final product. It will also be capable of applying coating and micro nutrients to keep up with developments in fertiliser coating technology and crop requirements. 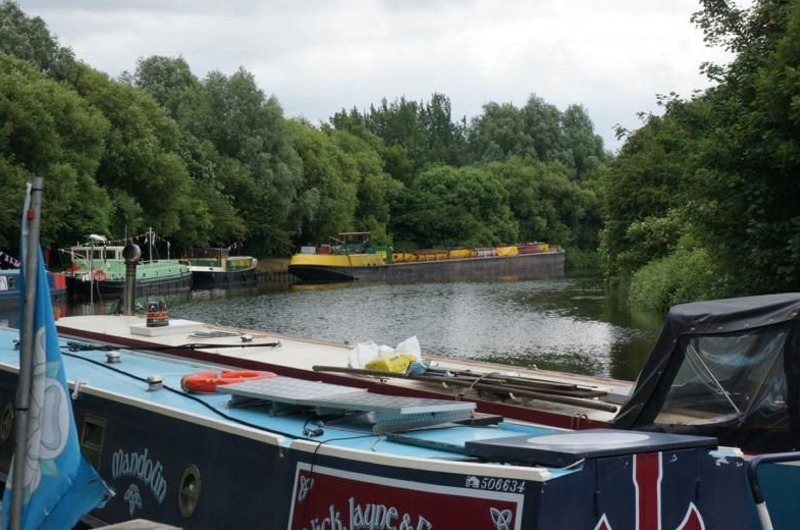 The Association was once again asked by organisers the Inland Waterways Association, the Canal and River Trust, Thwaite Mill and Aire Action Leeds to provide a freight barge for display at the annual Leeds on Water Festival over the weekend 29th and 30th June. 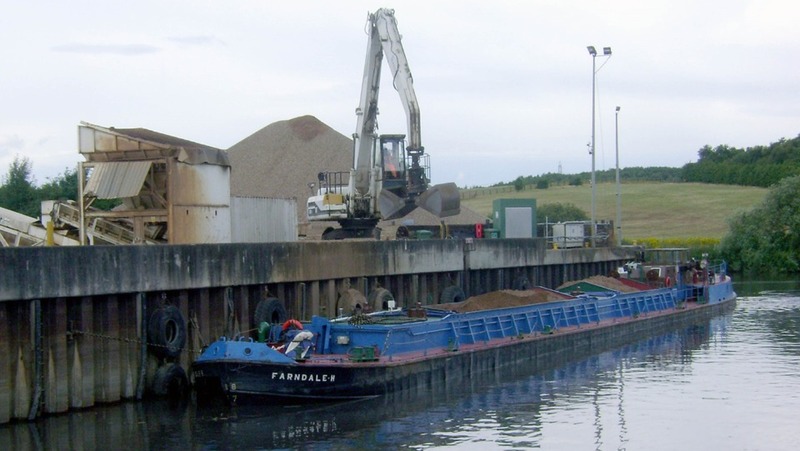 Member company Humber Barges Ltd was able to send the 450 tonne craft ‘Fusedale H’ up to the Thwaite Mill site, Stourton, Leeds after discharging gravel at Whitwood. She was an impressive sight and prompted many comments from visitors although the mooring, this year, did not allow the vessel to get close enough to the bank to allow members of the public to board. We are grateful to owners of private pleasure craft for assistance with turning and mooring and for their general interest and support. CBOA also had its new ‘pop up’ banner on display detailing the many aspects of CBOA’s work, along with a large banner on the vessel itself. Many thanks to Humber Barges Ltd and skipper of ‘Fusedale H’ Chris Oatway. This is good news that more local authorities are taking note of the potential use of the waterways for freight carriage within their district. Beer to the UK is shipped in 45 ft containers aboard river barges that head to the port of Rotterdam every day. By sharing the barge with confectionary from Mars and ketchup from Heinz, the full load ensures the environmental impact of distribution is significantly reduced for the three companies. "In recent years, Bavaria has undertaken a range of measures to reduce emissions associated with transportation. We send our beers across Europe by train and were the first brewer in Europe to switch our distribution fleet to trucks that meet the low-emission Euro 6 standard. "Hopefully we will see other European brewers and manufacturers follow our lead and start shipping to Rotterdam by barge for their global exports." The May bank holiday weekend will see a colourful gathering of canal craft at Paddington’s Little Venice Basin for Canalway Cavalcade, and a reminder that our canal system provides wonderful opportunities for pleasure boating, fishing, walking and even cycle routes for commuters. It is also worth remembering that the canal system was built to carry freight and while in this day and age much of the system is not ideally suited to this purpose there are certainly parts of our waterways where the freight potential should be taken far more seriously than often it is. The theme for this year’s Canalway Cavalcade is Celebrating London’s Waterways and it is most appropriate that the occasion will be the opportunity to present the Vivian Bulkeley-Johnson trophy to a firm based in Brentwood. Bulkeley-Johnson was a canal enthusiast with his own cruiser but had also built up the Willow Wren company, one of the last major narrow boat firms. He gave the trophy to the Inland Waterways Association to be presented each year to an individual or firm that had made a significant contribution to freight carrying by water. It is our pleasure that this year the trophy goes to S. Walsh and Sons Ltd. Starting in 1968 in the civil engineering plant business the company now provides a wide range of services to the construction industry. In particular they have increasingly used water transport and have a well developed marine division. Their barges are servicing a large number of sites including Lotts Road, Crossrail’s Canary Wharf station Blackfriar’s station, Crossrail and Thames Water’s tunnelling activities and land reclamation projects in Pitsea and Wallasea Island. Their fleet capacity has been increased by modernisation of existing craft and new tugs and barges from the Czech Republic and the Netherlands. On behalf of S Walsh & Sons Ltd., Nick Walsh receives the IWA’s Bulkeley-Johnson trophy from Les Etheridge, the IWA National Chairman. Mark Robinson, left, is Marine Manager of the company. Joining the Trust after more than a decade in senior roles managing large complex transport and infrastructure organisations, Richard comments: “I am really excited to be joining the Canal & River Trust at such an important phase in the future of the nation’s magnificent waterways. The scale of the opportunity is huge as what we and our supporters do in the next five years will help shape the waterways for the next century. “I bring a track-record of managing similarly complex and challenging networks, together with experience of working closely with a wide range of interested and passionate people. I’ve got bags of enthusiasm for the waterways and have seen first-hand the shot in the arm that canals provide to the communities they flow through. Out on the towpath I have witnessed the hugely committed staff, volunteers, boaters and other supporters, and I look forward to the challenge ahead." Currently at FirstGroup, Richard headed up First's bid in 2012 for the InterCity West Coast line and more recently has been leading First's highly-regarded Hull Trains company as well as other wider development programmes across First's rail businesses. Before that he spent 19 years at London Underground (LU) and Transport for London (TfL) where he had a range of senior roles, spending eight years as a director of LU, including a year as interim LU managing director (2009-10), and then a further 18 months as deputy managing director, TfL Rail and Underground (2010-11). Richard is also a trustee of People 1st – the sector skills council for hospitality, passenger transport, travel and tourism – which works to transform skills in the sector, particularly in the areas of management and leadership, customer service and craft/technical skills. Tony Hales, chairman of the Canal & River Trust, said: “I am delighted to welcome Richard to the Canal & River Trust. He joins one of the newest, biggest and brightest entrants in the charity sector – an organisation that shares his passion for the waterways. “He has fantastic experience of managing complex infrastructure – something which is crucial for our network of lock flights, embankments, soaring aqueducts and other engineering feats of the industrial age. He has a strong record of leading organisations through change and recognises the importance of growing the engagement with the boaters, anglers and millions of others in the community who use and enjoy our wonderful waterways. Richard, 46, married with two teenage daughters, lives in the West Midlands. Global cereal manufacturer Kellogg has moved to substantially increase the efficiency of its supply chain and take hundreds of trucks off UK roads. Kellogg has increased the volume of breakfast cereals it will transport using Peel Ports’ “green highway network”, which already serves other major retail names such as Princes Foods, Kingsland Wine, Tesco, Typhoo and Regatta. Around 2,500teu of Kellogg’s cereal products will move between the shipper’s Manchester, Ireland and Iberia distribution hubs, transhipped at the port of Liverpool onto a coastal feeder service to serve the Irish and Spanish markets. Kellogg has also taken advantage of the port of Liverpool’s “on demand” warehousing offering, with storage for up to 7,000 pallets of cereal product available at the port when required. Kellogg’s use of the shuttle service will equate to an 85% reduction in road miles for its supply chain: a reduction of 40,000 road miles and 61 tonnes of CO2 this year. Paul McCoy, Business Development Manager for Containers and Barge at Peel Ports said: “Peel Ports is developing a series of mini ports and multimodal logistics hubs at various locations along the Manchester Ship Canal, which means we can bring containerised products inland to exactly where the customer wants it. Luke Geiver, Associate Editor of Biomass Power & Thermal, records that there have been an increasing number of inquiries from energy developers who want to transport biomass via barge on the country’s inland waterways. Traditionally barges on British waterways have carried steel, timber, aggregates, oil, bricks, coal and more recently, waste and recycling materials. In many instances, according to David Lowe of the Commercial Boat Operators Association (CBOA), moving biomass on a canal or river system can save time and money. This creates a competitive advantage for product which can be sourced and processed in close proximity to the waterway – “waterside to waterside,” as Stuart McKenzie, freight operations manager of British Waterways says. McKenzie adds that waterway transport provides environmental benefits - according to Lowe, water freight produces just 20% of the greenhouse gases emitted by road transportation. The biggest commercial advantage is linked to savings in fuel and labour. The Freight Transport Association estimates that fuel accounts for 40% of the costs associated with truck transport but only 20% for water transport systems. Lowe points out that one or two men working a barge can move more product than one or two men driving a truck. 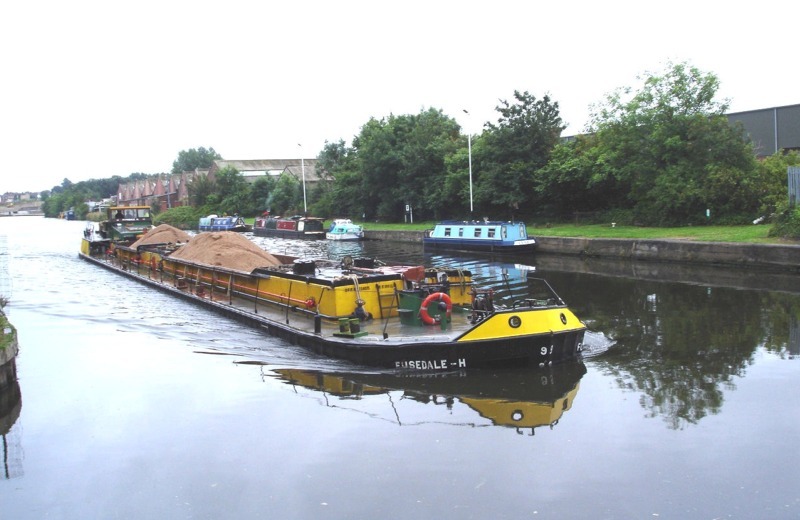 Dalkia has acquired the necessary planning permits to use the Aire & Calder navigational canal network to transport 360,000 metric tons of wood waste annually for use at a 53 MW power facility currently under development. They will use shipping containers to ensure time-saving and efficient loading and unloading processes. As the costs of traditional roadway transport are closely tied to rising diesel fuel costs, it’s possible that there will be increasing interest in canal freight. Peel Ports has invested in a substantially larger vessel for their Manchester Ship Canal container service after another marked increase in demand from customers who include Kellogg's, Princes Foods and Kingsland Wine. The move to the larger vessel, which operates on the UK’s largest inland seaway, follows a similar upgrade in May 2012. The service has already removed hundreds of thousands of freight miles from UK roads. The Coastal Deniz has a 260 TEU capacity, which equates to more than a 60% increase in capacity compared to the previous vessel used. By transporting significantly larger volumes of containers per sailing, Peel Ports says it will increase the value it offers to its customers whilst significantly decreasing their impact on the environment. The Deniz will make up to four sailings a week between the Port of Liverpool’s Seaforth container terminal and Irlam Container Terminal near Trafford Park in Manchester. The service also makes calls en route at Ellesmere Port. Our Ship Canal container service was already a compelling logistics solution, but it just got bigger and better. We know that our customers value efficiency and sustainability, and this upgrade is just one of a number of initiatives we are able to offer them alongside port centric warehousing and consolidation. 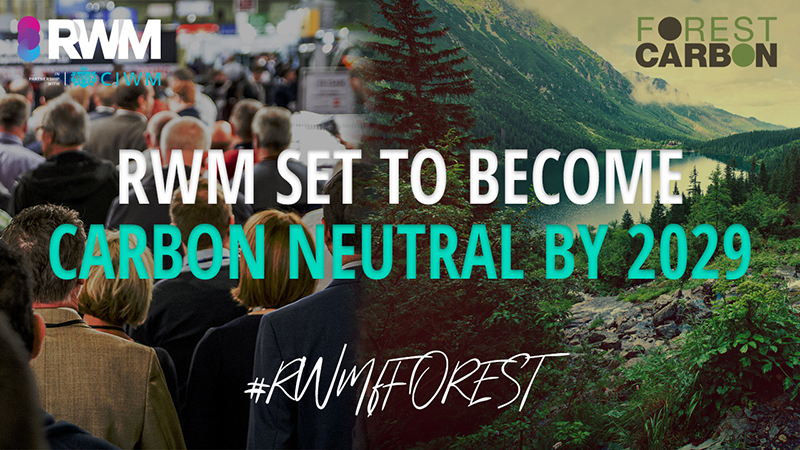 It allows customers to reduce their carbon footprint in a cost neutral manner. The Deniz will move in the region of 20,000 containers in 2013. That’s 20,000 fewer containers making the journey between Liverpool and Manchester by truck. In terms of carbon footprint that’s a huge saving of around 1000 tonnes of carbon and 1.3 million km of freight taken off UK roads every year. Peel Ports has a track record of being consistently innovative when it comes to increasing the efficiency of our customer’s supply chains. We are currently developing a series of mini ports and multi-modal logistics hubs at various locations along the length of the Canal, which means our customers will be able to move their goods from anywhere in the world right into the heart of the UK without touching an inch of road tarmac. The Manchester Ship Canal is a unique proposition which is transforming the way that many of our customers do business. In July 2011 Leeds City Council Planners published the‘Leeds Natural Resources & Waste Local Plan’. The Plan will form part of the statutory development plan under the Government’s new Local Development Framework and as such applications for planning permission will need to comply with it. In accordance with planning rules it was examined in public between November and December of that year. The Inspector’s report has just been published and following some minor revisions the Inspector, Melvyn Middleton, has upheld the plan as ‘sound’. The other existing protected wharves are at Haigh Park Road (now used by ASD Metal Services for storage) and the Fleet Oil Terminal. The Plan also protects a large CRT site in Skelton Grange Road with potential for a new wharf which had been earmarked by BW as a container terminal but could also be used for handling general cargoes and marine aggregates. The Inspector has ruled that protected sites should not be sterilised indefinitely, will be subject to five yearly review, and that under certain conditions activities not utilising water transport could be permitted. It is expected that the Plan will be approved by Leeds City Council in February 2013. Every year the Viaduct shipping operations are saving 46,000 road miles (that’s nearly twice around planet earth!) and 1786 lorry journeys. It is estimated that in the 30 years that they have been operating, ¾ of a million road miles have been saved and 30,000 lorry journeys. ‘Loach’ and ‘James Jackson Grundy’ unloading at Frodsham. Designed in collaboration with CBOA and in conjunction with specialist transportation solicitors Myton Law, the scheme pulls together the traditional elements of Maritime underwriting and offers them as a combined package, under a single policy. This saves time and effort for members who traditionally may have used the services of multiple insurers and brokers to achieve the same result. By issuing a single policy that combines several elements together we are also able to deliver extremely competitive premiums and reduce the administration burden that insurance has on members. Additional covers are available for consideration on request. Use of the scheme also includes a new set of Terms and Conditions of Carriage which are available exclusively to CBOA members. Enquiries to be directed to Paul Buckle or David Hamilton on 01482 213 215 or email cboa@insurance-partnership.com. The national Commercial Boat Operators Association has been working with The Insurance Partnership and specialist shipping law firm Myton Law, both based in Hull, to develop a dedicated insurance scheme and standard conditions of carriage for its members. The UK’s waterways carried 41.4m tonnes in 2009 (latest DfT statistics), including tonnages by ship to inland ports. 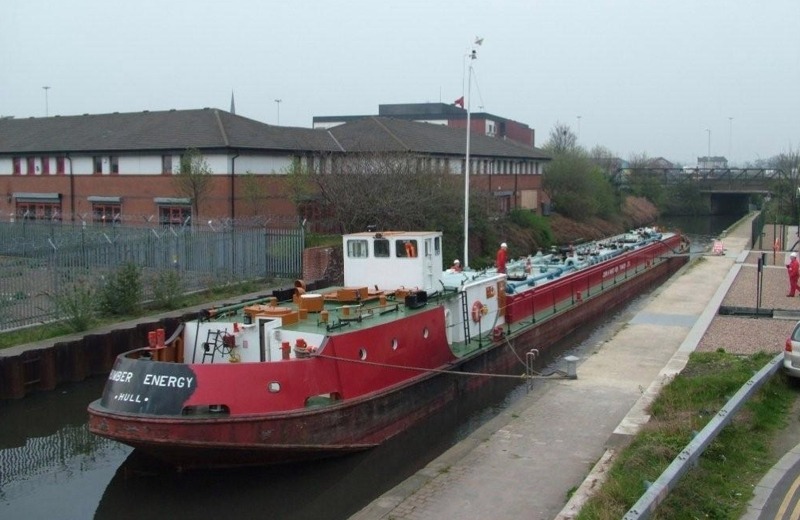 Manchester’s Tyndall Centre for Climate Change has said that moving freight by water is more fuel efficient and environmentally friendly per tonne per mile, with barges producing only 25 per cent of the carbon gases that lorries do. The CBOA reports that fuel accounts for about 20 per cent of barge operating costs, compared with 40 per cent for lorries (according to the Freight Transport Association). The CBOA represents the UK’s major inland waterways operators, including narrow boat, barge, and small sea going vessel owners. Its members are active in the four main rivers/estuaries of the Thames, Humber, Mersey and Severn. The CBOA has nearly 100 members, including associates. Work undertaken for the CBOA by The Insurance Partnership and Myton Law is aimed at ensuring members’ insurance provision and conditions of carriage are up to date and fit for purpose as the industry targets further business growth from companies considering freight carriage on our waterways in order to meet environmental goals. The Insurance Partnership and Myton Law have been working with the CBOA for the last year to arrive at the new insurance provision and conditions, which have now been adopted by the CBOA. The Commercial Boat Operators Association is a trade association which furthers its members’ interests by publicising and promoting the development of freight traffic on the inland and estuarial waters of this country. The Insurance Partnership controls gross written premiums in excess of £50 million per annum, £100 million funds under management and employs in excess of 180 people across the Group over six offices throughout the UK. TIP provides a wide range of services which include; insurance broking, health insurance, health & safety services, financial services and commercial finance. Myton Law provides legal advice to regional, national and international exporters/importers, ship owners, port operators, logistics companies, insurers and insurance brokers. Green Line Oils began taking 17,000 tonnes a year by barge. This has now risen to 35,000 tonnes a year. They move about 700 tonnes a week, unloading a barge every 3-4 days. Each barge takes as much as 500 tonnes, replacing 20 road tankers. 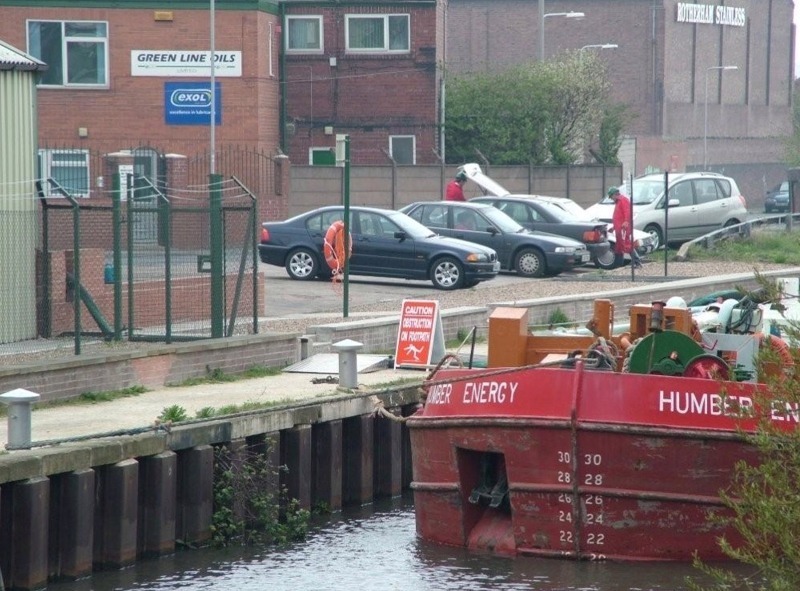 Green Line Oils engaged Hull-based motor barge tanker company John H Whitaker (Tankers) Ltd to transport the oil from Hull to Rotherham on the Sheffield and South Yorkshire Navigation. He adds that using barges is a “much more efficient” use of labour than using road tankers. A crew of three is needed for each 15 hour barge tanker journey. The same three men driving road tankers would need seven trips to complete the delivery and this could not be done in the same time. Leeds City Council proposes to safeguard six wharves in Leeds as part of their mineral long term strategy. Originally, two were proposed but the increase came after CBOA’s representations. The Leeds area is an importer of aggregates and the planners were concerned how to get sand and gravel into Leeds with the minimum effect on roads. Spotting that the Aire and Calder Navigation can takes barges with capacity of 500 tonnes and more, the planners came up with their proposals. CBOA congratulates Leeds City Council and looks forward to other councils safeguarding their wharves – following London’s lead where there are 50 safeguarded wharves. London's business leaders have reiterated their support for the Crossrail project on the day Crossrail announces that more than five million tonnes of material excavated from the project will be transported by boat along the Thames for use in landscaping projects. These include a new 1,500 acre nature reserve at Wallasea Island in Essex. Today Crossrail signed a Memorandum of Understanding (MoU) with the Port of London Authority (PLA) to confirm its commitment to use barges and ships along the Thames to move its excavated materials. If the equivalent five million tonnes were to be transported by road they would require up to half a million lorry journeys. "Moving five million tonnes of earth excavated from the centre of London requires a solution of Herculean proportions. Using the barges rather than the roads is a supremely brilliant plan and it brings joy to my heart to see them make their way up and down the Thames. "Using barges avoids the need for a huge number of lorries to grind their way through the city. It also brings together two of our key priorities - making better use of the river and keeping digging for Crossrail. "Crossrail will add at least £20 billion to the economy and employ some 14,000 people. It is crucial to London's economic prosperity and I'm absolutely delighted to see work steaming ahead." During the delivery of Crossrail, Europe's largest construction project, a total of 7.3 million m³ of material will be excavated, which is the equivalent of covering the whole of Hyde Park and Kensington Gardens with a three metre layer of soil. Close to 100% of the 7.3 million m³ of excavated material is expected to be clean and uncontaminated and can be reused elsewhere. The project will maximise the use of water and rail for the transport of excavated material, and project managers estimate that on a tonne per kilometre basis, 85 per cent of transport of the material will be by rail and water only. "This is a welcome announcement, which underlines the green credentials the Government is keen to see applied to this huge project, while reducing disruption to London's busy streets. "We are building a new railway line that will benefit millions of people, both directly and indirectly. By using excavated material to redevelop Wallasea Island and aid regeneration in Kent we are also creating a legacy which will benefit areas far beyond the route for generations to come." "All construction projects by their nature will result in some degree of disruption but it is critically important that the impact on central London is kept to a minimum while Crossrail's construction is underway. The final destinations for the excavated material in Essex and Kent have been specifically chosen to ensure that the vast majority is transported by either rail or river thereby limiting the impact on the road network. "That's why we've signed up to work with the PLA to help us make the most of the river for the project. Using the river is fundamental for us. You can move much more material on the river in one barge compared to a single lorry; doing so also takes much less energy and generates far fewer environmental emissions." "The Thames is London's greenest highway. It's already the busiest waterway in the country. We've been working alongside the Crossrail team to help them make the most of the river to help keep the impact of the construction of the rail links to a minimum. Our role is to help turn their vision into reality, linking their construction operations with sites on the river for handling materials. Today we're talking about moving materials out of the capital. Just as important is using the river to get the vital building materials to site and that's something we're already working on." Excavated material from tunnelling will generally be removed by rail and water while construction material from stations and station related work such as permanent access and ventilation shafts will generally be initially removed by road and then transferred to the river. Crossrail is working with the Port of London Authority and British Waterways to promote and maximise the use of water transport for delivery of construction materials and the removal of construction material and waste, and with the rail industry to ensure a joined-up approach to the use of rail for transportation of materials. Excavated materials from eastern tunnelling sites will go direct by river to Wallasea Island in Essex and to two regeneration sites in Kent. Material from the western tunnelling site at Royal Oak near Paddington will go by rail to the sites in Kent while some material will go by river to Wallasea Island. The Grand Union Canal is located in close proximity to the Royal Oak tunnelling site and Crossrail is considering what potential role it can play with the transfer of excavated material and the delivery of construction materials. At least two-thirds of all Crossrail excavated material, or 4 million m³, will be used to create a huge wildlife reserve in Essex. Clay, chalk, sand and gravel taken from the construction of Crossrail will be transferred by ship to Wallasea Island, eight miles north of Southend-on-Sea, which the RSPB will transform into 1,500 acres - nearly 2.5 square miles - of tidal wildlife habitat. Last year the RSPB submitted a planning application to Essex County Council and consent was issued on 9 July. Development of Wallasea Island is expected to start in 2010. Construction started on the Canary Wharf Station in the North Dock at Canary Wharf on 15 May 2009. The work requires approximately 150,000 m³ of materials to be excavated, which equates to approximately 300,000 tonnes. Not all of this will be transported - the preference is to test and re-use as much excavated material as possible on-site. The aim is to reuse around a third of the excavated soil. Material that does have to be transported will predominantly be taken via river-borne barges, removing an estimated 20,000 lorry loads from East London and Essex roads. Much of this material will transported downstream to the Veolia Environmental Services Pitsea landfill site at Holehaven Creek. The first barge arrived at Pitsea on 23 July. This material will help to transform the Pitsea site from landfill to high quality land for public access, without disturbing the nearby tidal mudflat, which is a 'site of special scientific interest'. 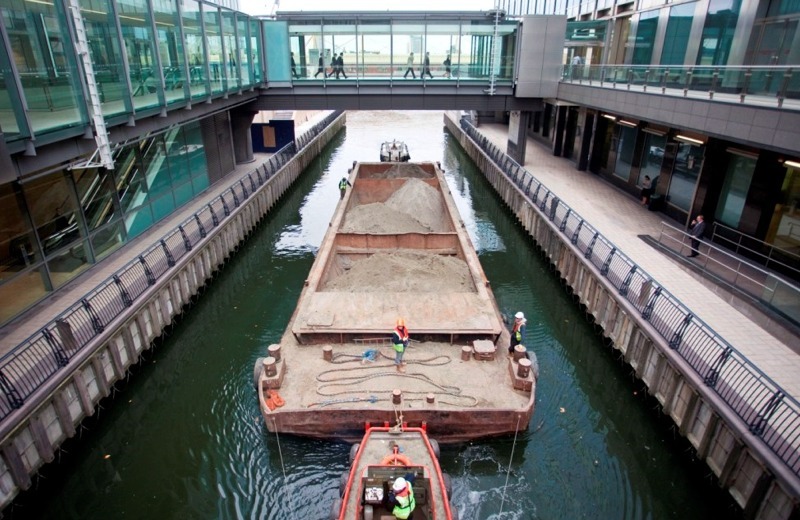 Canary Wharf Contractors has a long history of using water to transport construction materials. This helps it to alleviate impacts on the local community and environment and reduce costs and construction time. • There are eight barges in use. There are normally 3/4 onsite at any one time. • The large barges are approximately 25m x 6m wide and the smaller ones are 15m x 2m nes. The Commercial Boat Operators Association (CBOA) today welcomed the publication of the Peter Brett Associates’ (PBA) report commissioned by the East Midlands Development Agency (EMDA), East Midlands Regional Assembly (EMRA) and British Waterways (BW) into Current and Future Prospects of Freight Moving on the River Trent. CBOA: John Dodwell, Chairman, 020-7231-6247 or 07802-961485. CBOA is the trade association for companies which carry freight on the UK’s inland and estuarial waterways. CBOA members collectively offer a one-stop service to advise companies on what can be done to take freight off the roads and on to water to capture economic and environmental benefits. The Commercial Boat Operators Association (CBOA) has given its highest Member’s award, the Award of Excellence, to Wood, Hall & Heward. The citation commends the contemporary design of their promotional brochure highlighting the new age of the waterways and showing the benefits that construction site managers can gain through using barges. Based at Harefield, Middlesex, the company are water transport specialists. They were established relatively recently in 1997 and now operate more than 40 craft on rivers and canals in London and the south east. This enables them to take up to 80 tonnes in a single barge- the equivalent of four rigid lorries. Their main areas of activity include delivery of construction materials, transport of aggregates, waste and recyclates, the delivery of abnormal loads to site by barge, and infrastructure maintenance. It’s the first time the CBOA has made Awards of Excellence. This first year there were two, the other going to Exol Lubricants subsidiary Green Line Oils. 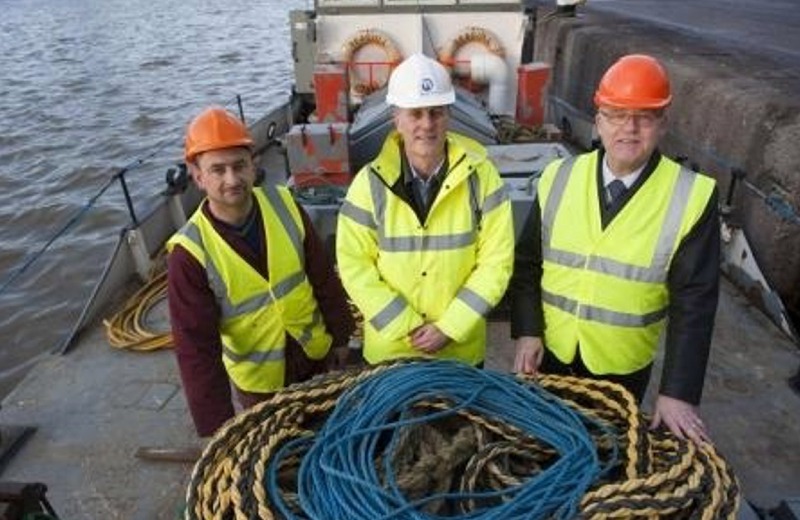 The West Midlands-based company won the award for its ‘vision, commitment and good business sense’ in using waterways as the vital link to transport base oil from the port of Hull to their blending plant at Rotherham. The Commercial Boat Operators Association (CBOA) has given its highest award, the Award of Excellence for 2009, to Green Line Oils. 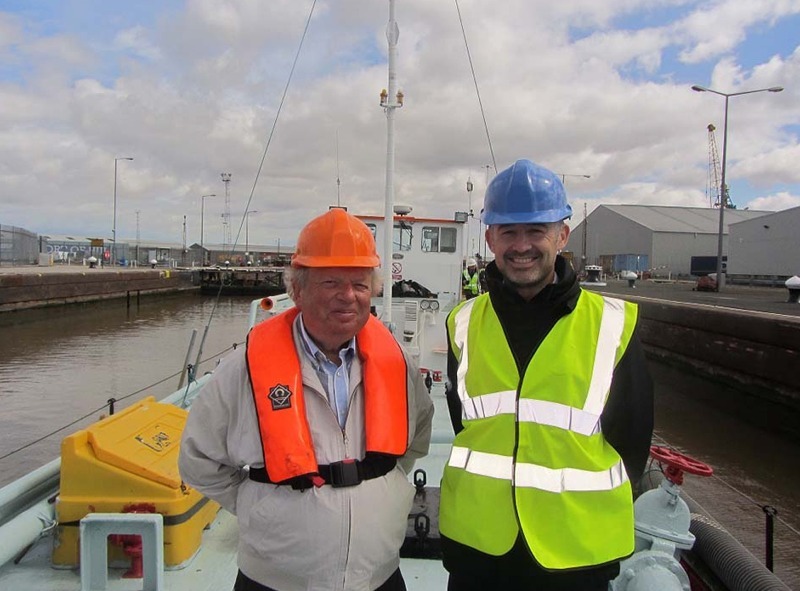 The citation recognises the company’s ‘vision, commitment and good business sense’ in using waterways as the vital link to transport base oil from the port of Hull to their blending plant at Rotherham, Yorkshire. Green Line Oils is a subsidiary of Exol Lubricants, the Wednesbury, West Midlands-based company. Exol Lubricants is the UK’s largest independent lubricants company. Green Line Oils began taking 17,000 tons per year by barge. This has now risen to 35,000 tons a year. At present they move on average about 700 tons a week, unloading a barge every 3-4 days. Each barge takes as much as 500 tonnes, replacing 20 road tankers. He added that using barges was a “much more efficient” use of labour than usingroadtankers.A crew of three was needed for each 15 hour barge tanker journey; the samethree men driving road tankers would need seven trips each to complete the delivery and this could not be done in the same time. A Freight Facility Grant (FFG) from the Department for Transport contributed to the cost ofinstalling the storage tanks at Rotherham. As the tonnage increased and more storage tanks were needed at Rotherham, a second FFG was obtained. These FFGs are made in recognition of the environmental benefits of taking traffic off the roads. It’s the first time the CBOA has made Award of Excellence. This first year there were two, the other going to the Harefield, Middlesex-based company Wood, Hall and Heward Ltd for their innovative promotional brochure. The company are water transport specialists and the award citation commends the contemporary design of their promotional brochure for highlighting the new age of the waterways. Exol Lubricants: Steve Everitt, Managing Director, 0121-568-6800. 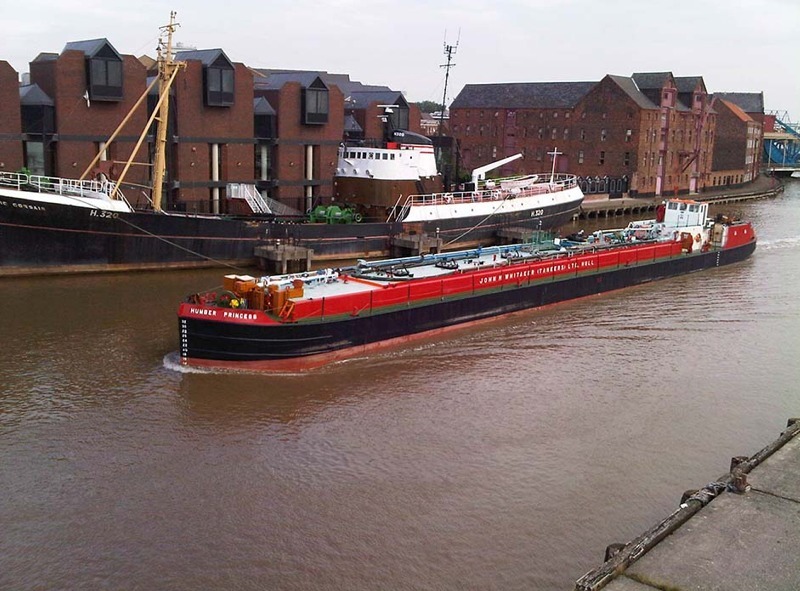 John H Whitaker (Tankers) Limited are a family owned business based in Hull and have successfully operated in the inland waterways and coastal tanker market since 1880. Whitakers specialise in bunkering visiting ships in the ports around the UK and also have fleet of inland barges capable of carrying all grades of bulk liquids within the United Kingdom. The idea of freight returning to the 2,800 miles of navigable waterways crossing the United Kingdom has, for many years, been little more than wistful dreams thought up by those who hark back to a distant past when shire horses pulled barges along tow paths and real men smoked pipes. But over recent years various interested parties have been taking a serious look at how the canals and waterways could once again be opened to freight transport and this time they may have cracked it. The high profile launch, by British Waterways in 2003, of a scheme using barges to transport of 450,000 tonnes of sand and gravel between Denham and West Drayton, thereby removing 45,000 lorry loads off the road over a seven year period, went some way towards illustrating that it was indeed possible for a return to carrying freight on smaller waterways, albeit with limited applications. However, over the last five years, huge steps in the development of water transport has been made and British Waterways’ partner in the Denham project, Land & Water Group has now designed and built a high capacity barge which makes freight transport on canals an environmentally and, perhaps more importantly, financially viable alternative to road haulage. 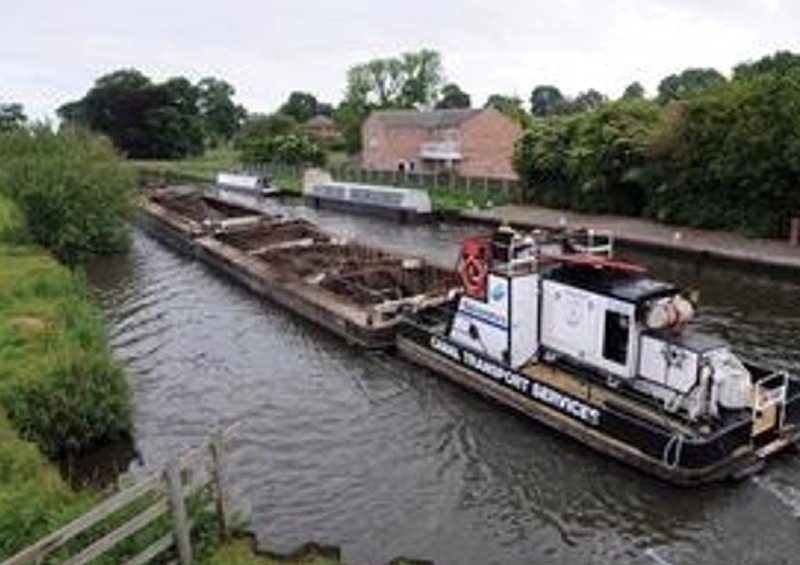 A framework dredging contractor for British Waterways since 2001, Land & Water was instrumental in the design and ongoing management of the entire Denham project from launch to the current day. It has first-hand experience of the limitations of operating on inner city canals and many lessons have been learnt since the launch of the original barges designed to carry the sand and gravel quarried in Denham. As with any waterway, canals need to be maintained in order to keep them operational and British Waterways undertakes an extensive programme of dredging and maintenance throughout the year. Despite this, traditional barges are limited as to the weight they are able to carry due not only by the depth of the canal, but also the amount of water a fully loaded barge displaces. 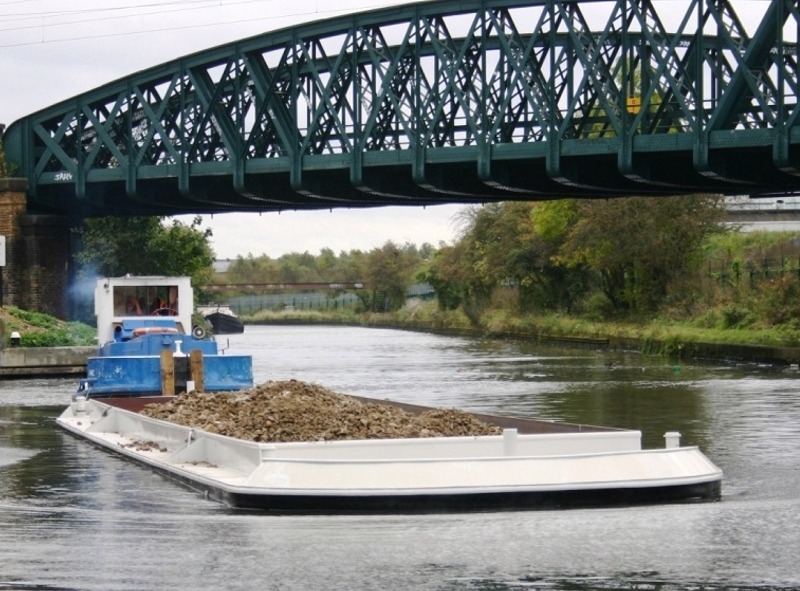 In order for freight by water to be a viable, cost-effective option, a special barge must to designed and built to cope with the unique conditions found in the waterways around the UK. Taking these lessons learned, Land & Water has developed a new Olympic class hopper barge to operate on waterways that may suffer the same syndrome. The new, light-weight vessel is extremely shallow drafted, taking advantage of Land & Water’s light-weight hull and single skin floor design, and with a bow and stern that adopts the Denham hopper barge principle; Land & Water can now carry in excess of 85 tonnes, at an operating draft of under 1.37m (4ft 6in – the leisure craft navigation depth). The Olympic Barge is being pressed into immediate action in a partnership with Powerday plc, one of the UK’s largest and forward-thinking waste management companies. Over the last two years Powerday has invested over £12 million in a state of the art recycling center, based at Old Oak Sidings, Park Royal on the outskirts of London, which is able to convert all forms of industrial and domestic waste into a series of re-useable materials. Once separated, the various waste constituents are all processed making this site one of the very few in the country which can genuinely claim to usefully recycle and reuse every constituent which comes through its gates. Waste wood is chipped and used at Slough power station to produce energy, nails are sold as scrap metal, plastics are separated and shredded before being processed for waste-to-energy and concrete is reduced to reclaimed aggregates and waste soils are recovered for re-use as a restoration soil at a remote landfill site, which is accessed directly by train from the site. The recycling center is based on the Grand Union Canal, and Powerday has installed a 75m long quay to accept barges up to 90 tonnes fully laden. 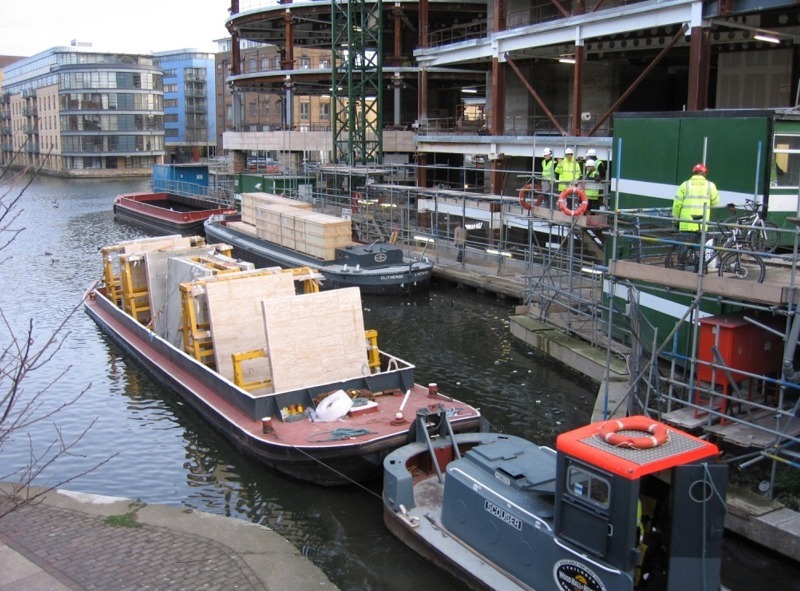 The combination of a custom designed barge and waterside recycling plant has made the concept of canal transport a genuine commercial option, and Land & Water and Powerday have formed a commercial agreement to jointly market and develop their multi-modal and sustainable solutions for waste streams and building materials in Central and West London. But it is the long-term potential, which is really exciting for the various parties involved. The Regents Canal links with the Grand Union, which passes through the heart of London, which in turn joins up with the Olympic site in Leytonstone in East London. In an age when pressure is on contractors to reduce traffic and pollution in the capital, freight transport by canal is now a viable alternative. It is already possible for all forms of waste to be loaded into the barge at various collecting sites across the capital and transported along the canal network to the processing plant at Old Oak Sidings at a competitive cost to conventional alternatives and without the environmental impact that more traditional road haulage would have. In addition, Land & Water has entered into partnerships with marine towage specialists GPS Marine Contractors Ltd. for tidal vessel movements on the Thames, and with S. Walsh and Sons (landfill and recycling operators in the East Thames Corridor) and a number of landfill operators in this area to provide a one-stop shop for East London and Thames-side projects. With an impressive ability to haul large amount of freight along a network of canals ready and waiting to be utilized, the Olympic barge may just be the answer to those who dream of a return to yesteryear. Powerday operates the largest Materials Recovery Facility in the south of England, and is licensed to accept a wide range of materials 24 hours a day, 7 days a week. More than £12 million has been invested in the 1.6 million tonne recycling facility at Willesden Junction, which can receive waste materials by canal, rail or road. Recyclables can be moved out by all three transport modes, making it one of the most flexible facilities in the country. The "green" barge shuttling containers up the Manchester Ship Canal from the Port of Liverpool to the heart of the North West of England is now making a regular "bus stop" call at Ellesmere Port en route to Irlam Container Terminal. The push tug and barge discharged an initial 50 containers of organic molasses shipped into Liverpool's Royal Seaforth Container Terminal by Mediterranean Shipping Company from Paraguay, before sailing on up the Canal with boxes of Tesco wines bound for Manchester. The molasses is being shipped into the UK by the Organic Division of Uren Food Group Limited, for distribution as livestock feed to organically certified farms. Said Director James Uren, who founded the organic division of the family business 13 years ago: "The waterborne onward movement of the containers from the Port of Liverpool to Ellesmere Port fits well with the ethos of our organic activities and provides the most economic and environment friendly method of inland transportation." 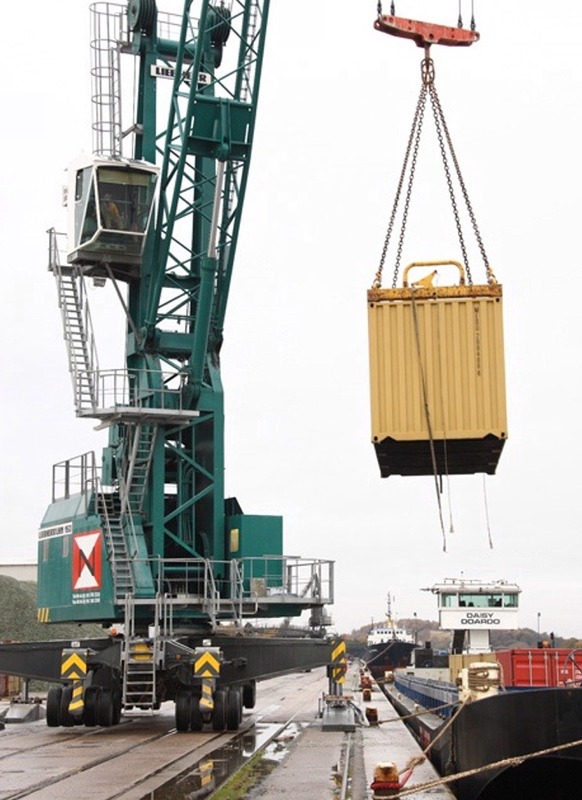 The dawn discharge of the containers at Ellesmere Port was undertaken by Quality Freight (UK) Limited using their new £1 million Liebherr 150 mobile harbour crane. An hour later, the barge sailed for its next delivery stop at Irlam Container Terminal on the Ship Canal. Sebastian Gardiner, Managing Director of Quality Freight (UK) Ltd said: "It was a text book discharge operation which we now expect to repeat on a regular basis for containers carrying not just molasses, but other cargoes bound for the North of England. Quality Freight is working with Peel Ports to grow the volume of freight moved by barge and reduce the road miles and carbon footprint of the logistics industry." The liquid molasses is moved from Ellesmere Port to the Shropshire processing plant of Prime Molasses Limited for distribution to farms and animal feed manufacturers across the country. Frank Robotham, Marketing Director of Peel Ports Group which owns the Port of Liverpool and the Manchester Ship Canal, commented: "Adding a regular call at Ellesmere Port to the shuttle's sailing schedule increases the flexibility of the service to shippers seeking a cost effective and environmentally sensitive means of moving their cargoes in and out of the North West of England. "We are delighted that more companies such as Uren Food Group are utilising this unique transhipment service to minimise both costs and their carbon footprint." March 2009 - Experience narrow boating on the Midlands canals. Experience narrow boating on the Midlands canals. Bespoke Executive Solutions Ltd is a Family run business offering an unrivalled variety of canal-based activities, with a portfolio of services ranging from trip boats to boat handling courses, camping boats to luxury Skippered charters, Bespoke Executive Solutions Ltd aims to be able to offer Narrowboating experiences to a wide ranging market. 2009 sees the launch of our group activity packages, aimed at corporate groups, clubs etc, up to 36 people. Families, individuals and organisations are not forgotten, see our website (below) for details! Residential options are available for a whole weekend afloat, actually working 1930’s historic craft through the locks and visiting places of interest along the way. Maybe just a three-hour cruise on our trip boat, that has 36 covers, a fully stocked bar and a dance floor, would suit your group? Whether you just want to relax and enjoy an unusual view of the world as the boat glides along, or whether you are looking for a novel venue for that special celebration or group outing, our boats are ideal. Email us at the address below and we will send you our latest E – Brochure with all the details. Planning a boating holiday or even a career afloat…? Taster days afloat and a basic qualification prior to your holiday. NCBA, RYA & MCA Training. Luxury Boat Holidays – With a professional Skipper, or self-steer. Skippering services and crew provision. Event Management, including venue and infrastructure provision. Schools programmes and youth training, including special needs. Floating plant and equipment to industry. Consultancy services for the Leisure Industry, working along the Midlands canals. Outdoor pursuits activities at canalside locations.